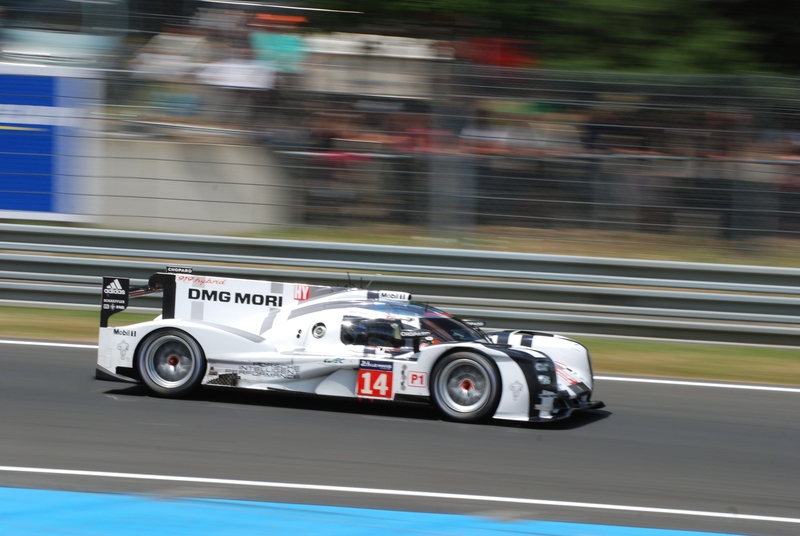 For anyone familiar with the Porsche brand, the name Le Mans has always been closely linked to their impressive racing history. 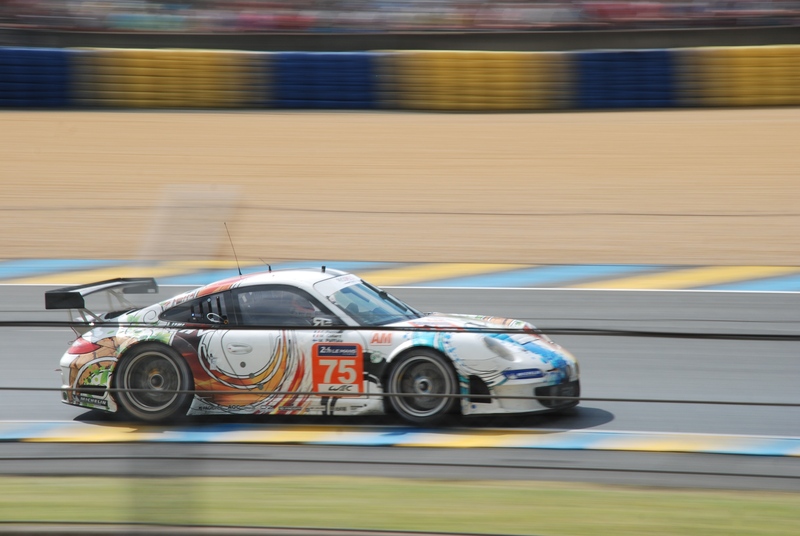 After developing a passion for Porsches as I entered my teenage years, I began studying and researching these significant Porsche race cars and those victories achieved at this mysterious French race track. 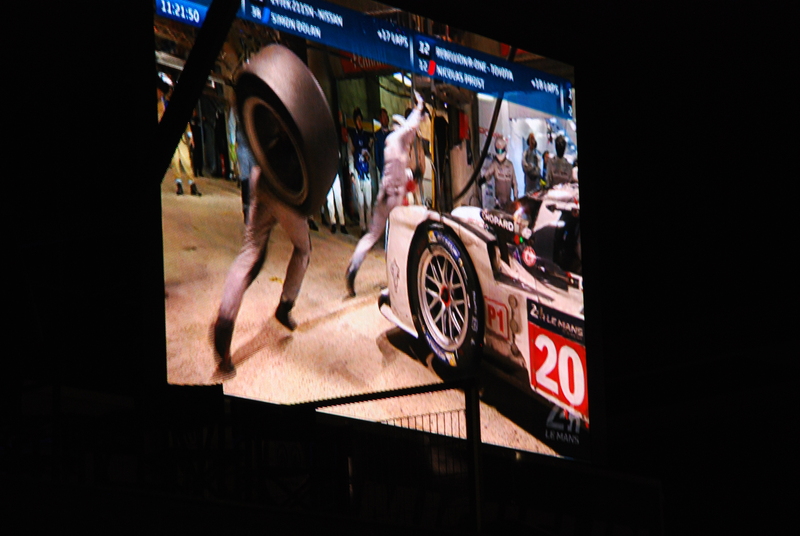 At that moment, the hook was set and attending the 24 Hours of Le Mans race became a lifelong aspiration. 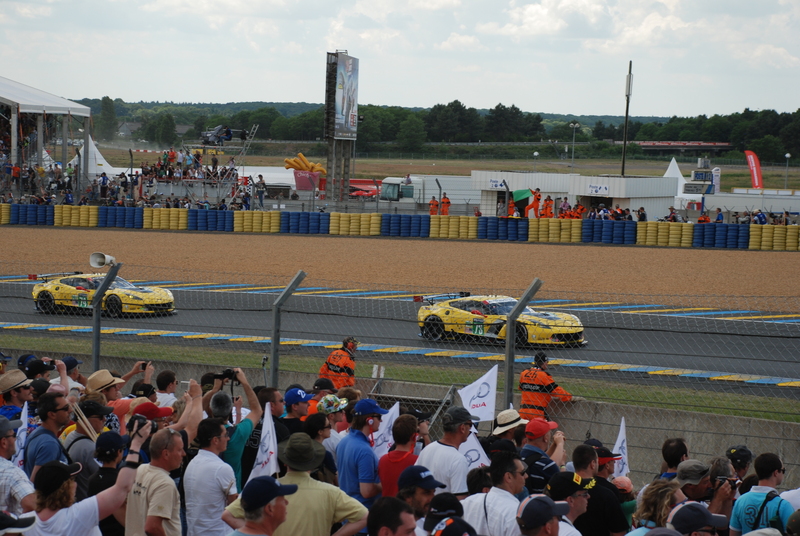 I did come close to fulfilling this very dream of attending Le Mans twice; once in 2001 and the second time in 2002, while living and working in France. 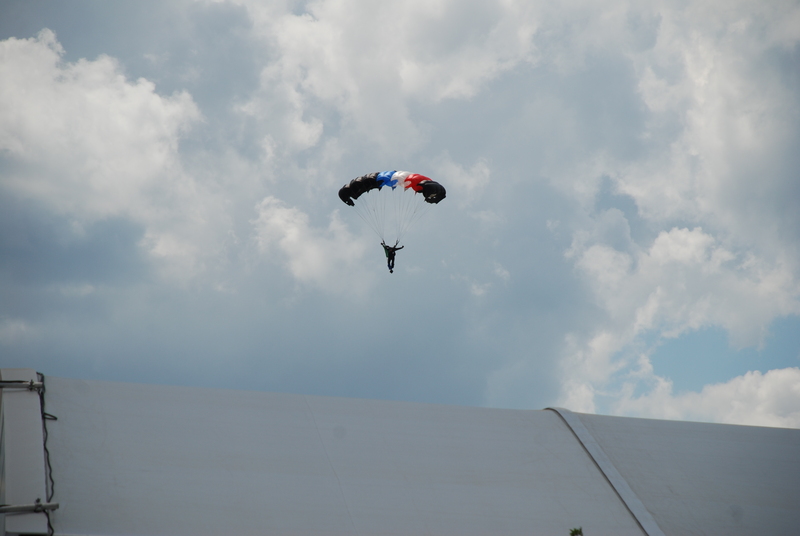 However, each year due to schedule conflicts, I was unable to attend. 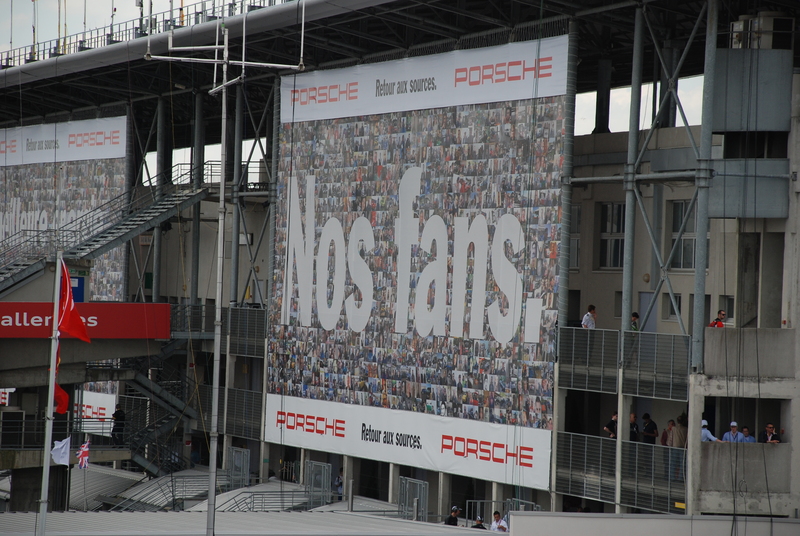 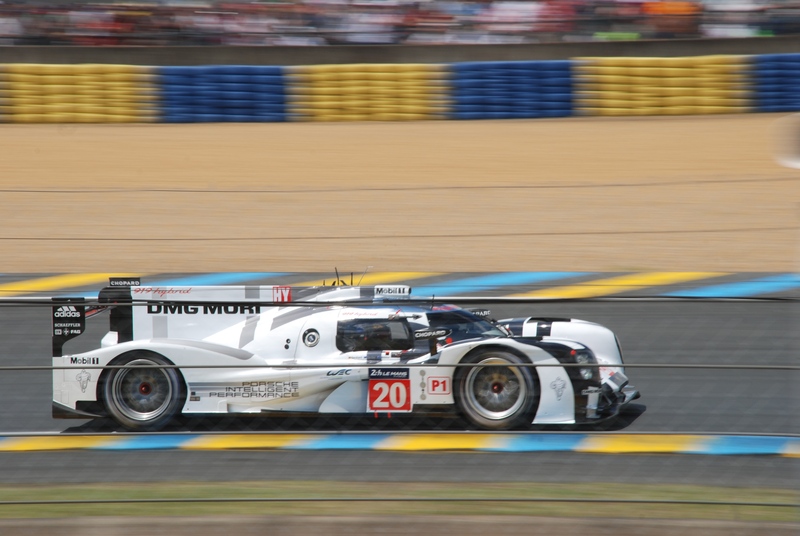 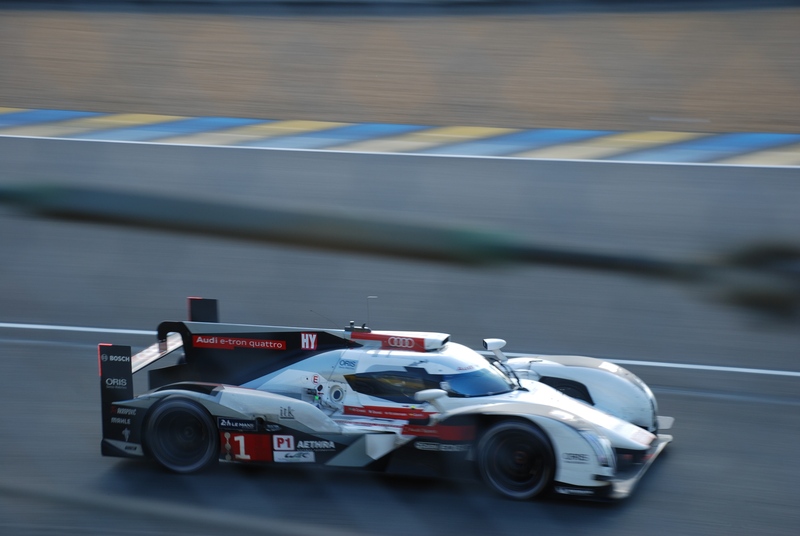 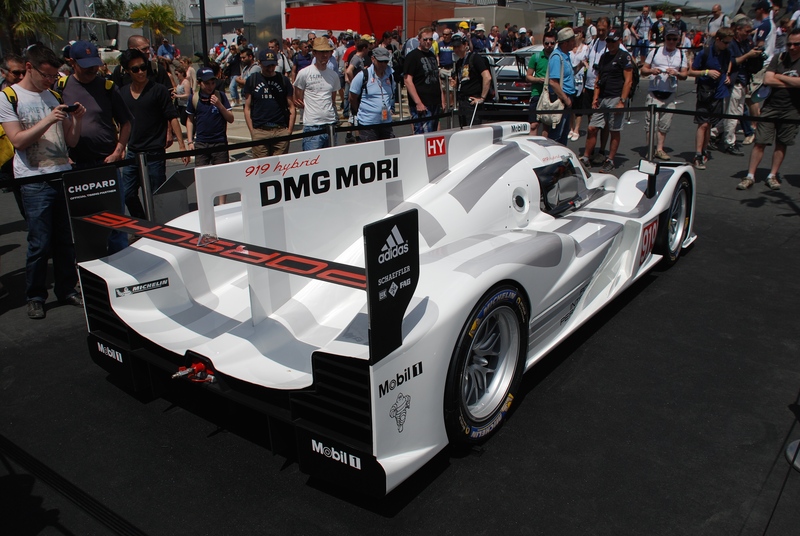 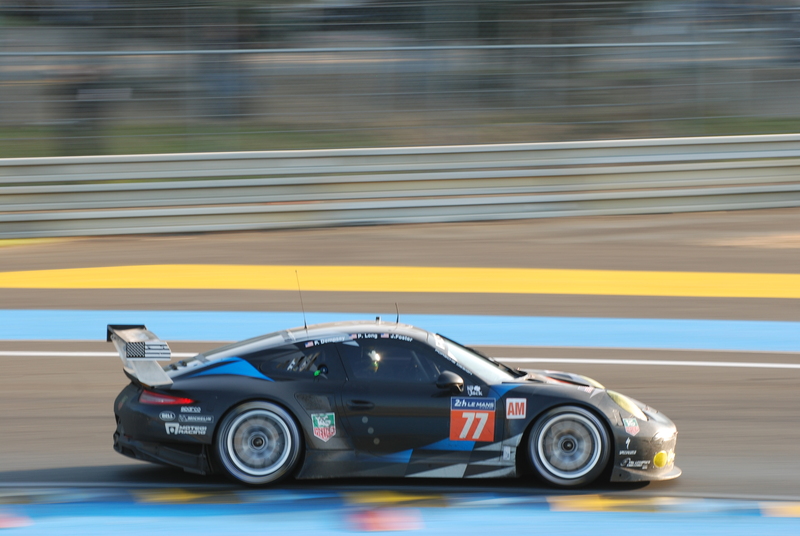 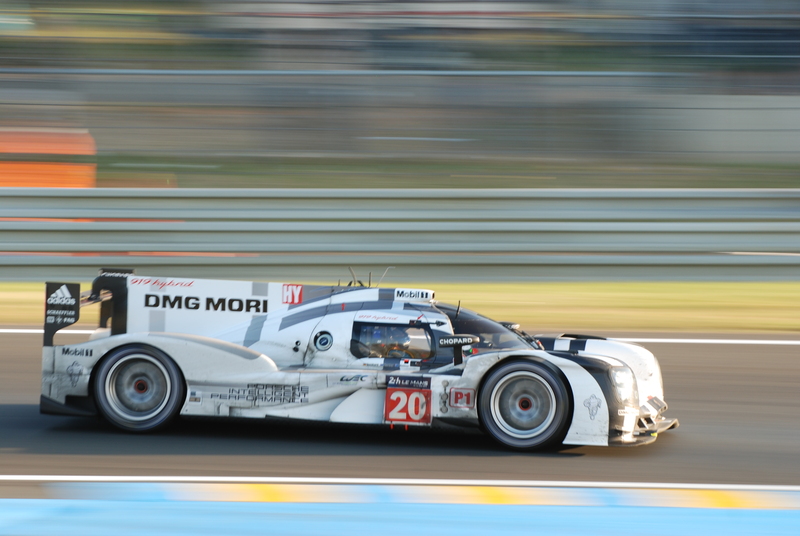 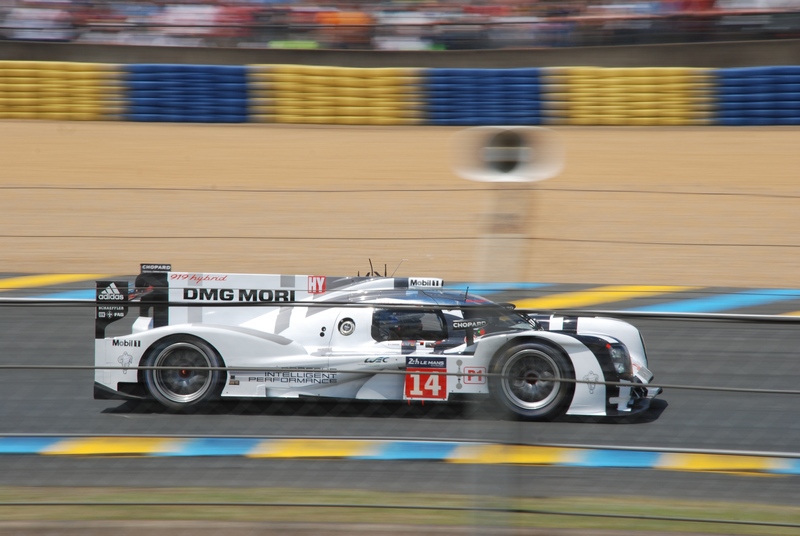 So imagine my surprise when Porsche announced their return to Le Mans for 2014, after a 16 year hiatus with the following statement – “Mission 2014. 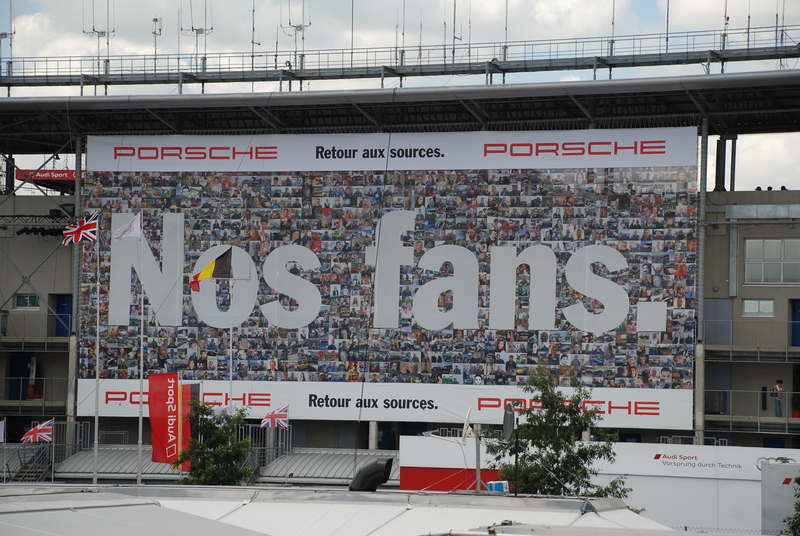 Our Return”. 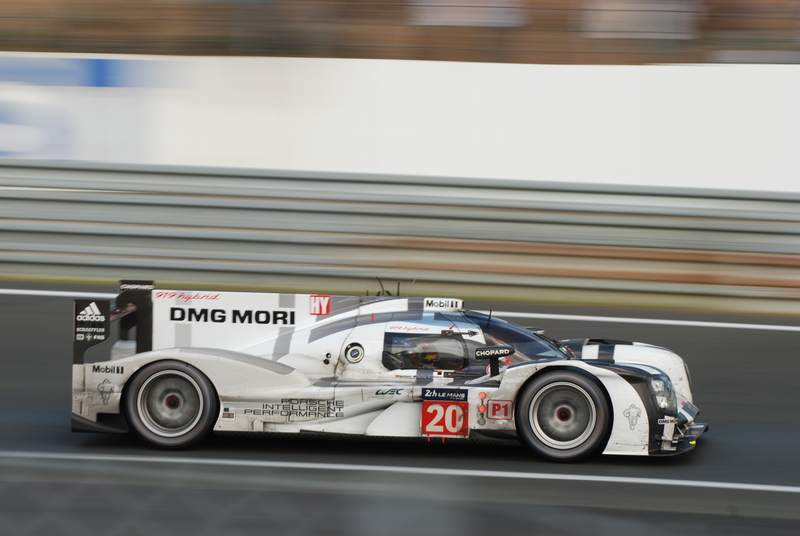 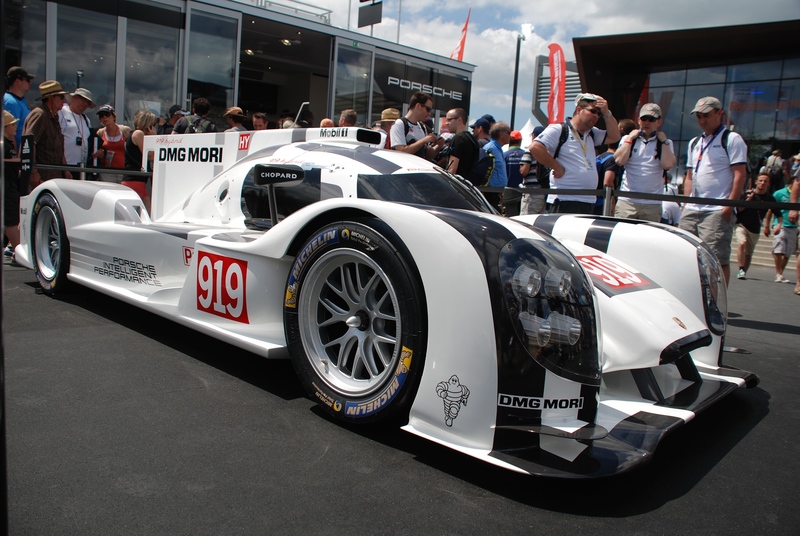 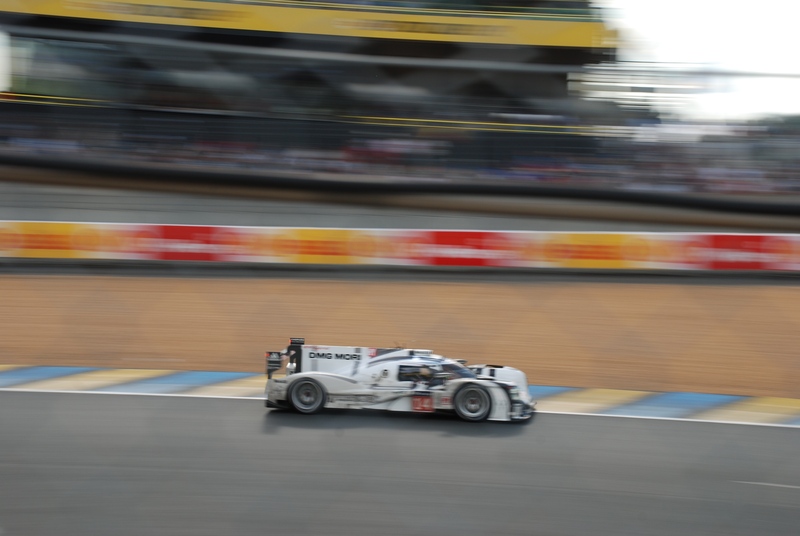 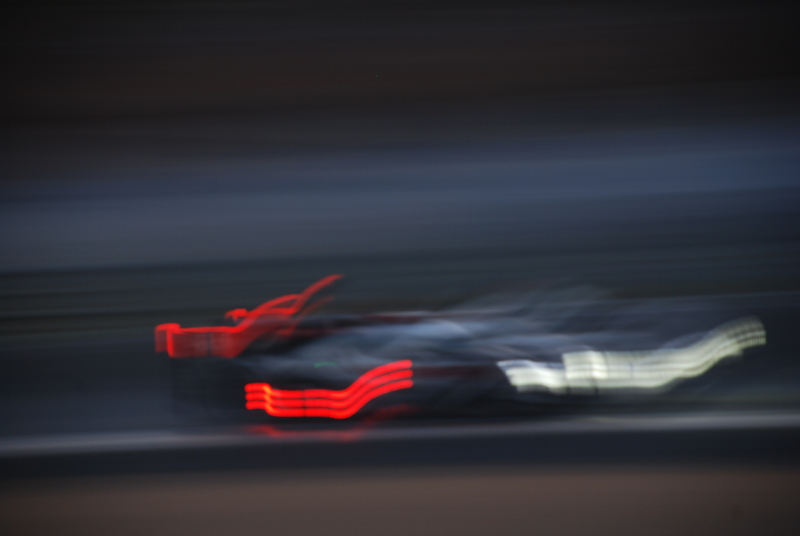 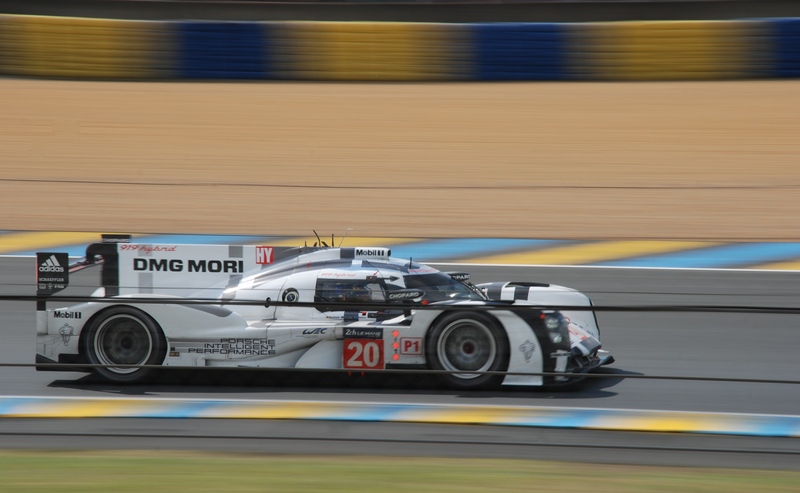 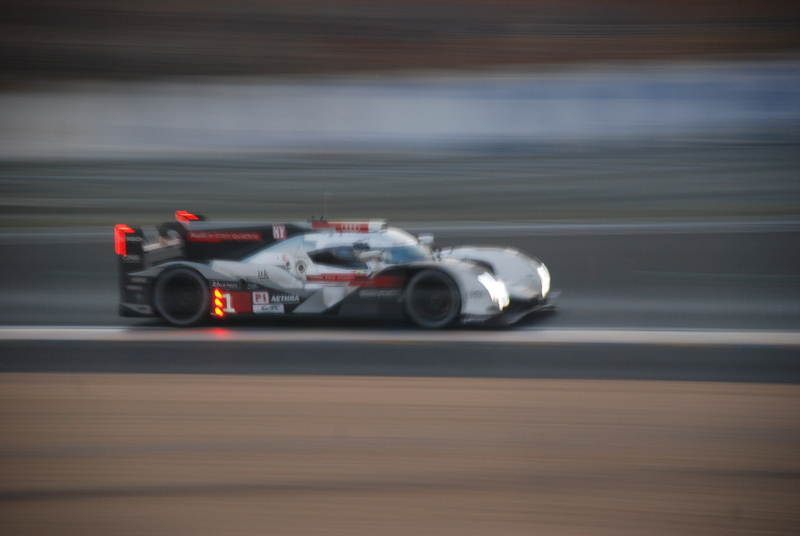 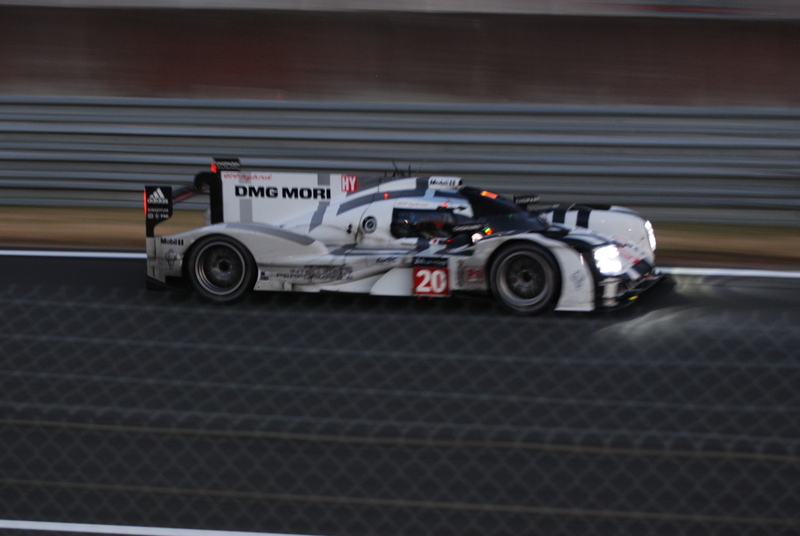 And return they would, with a pair of brand new race cars; the Porsche 919 hybrid. 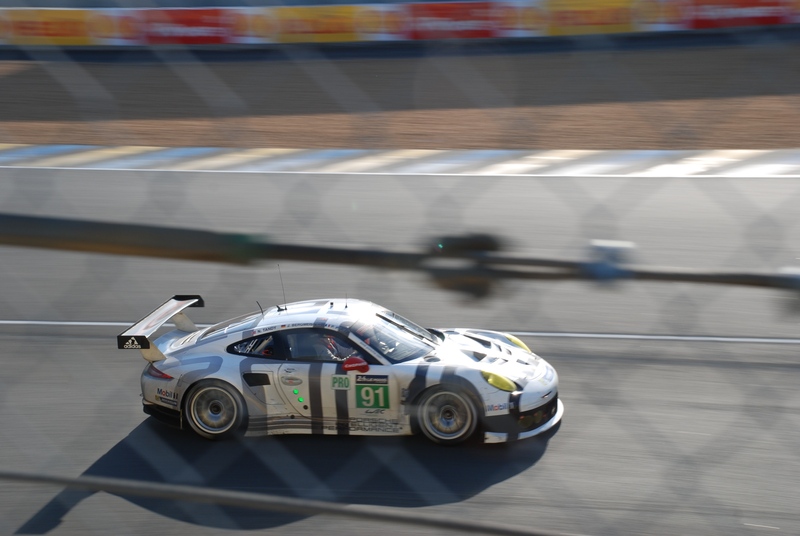 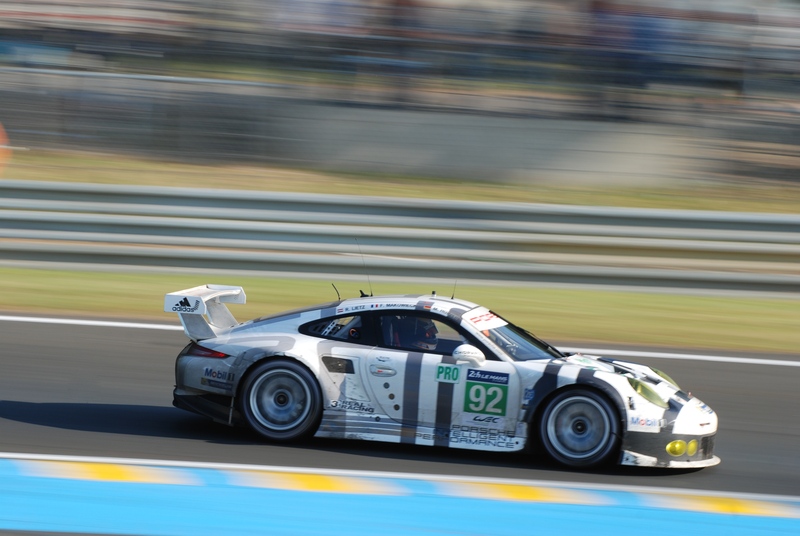 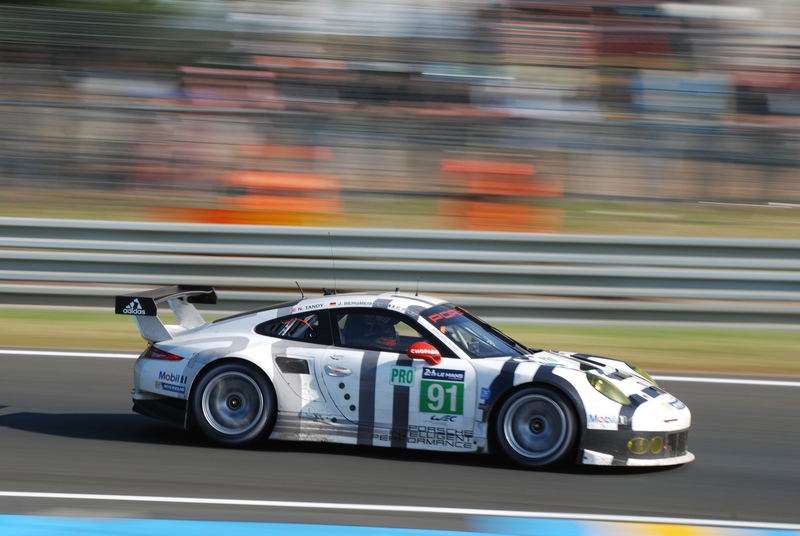 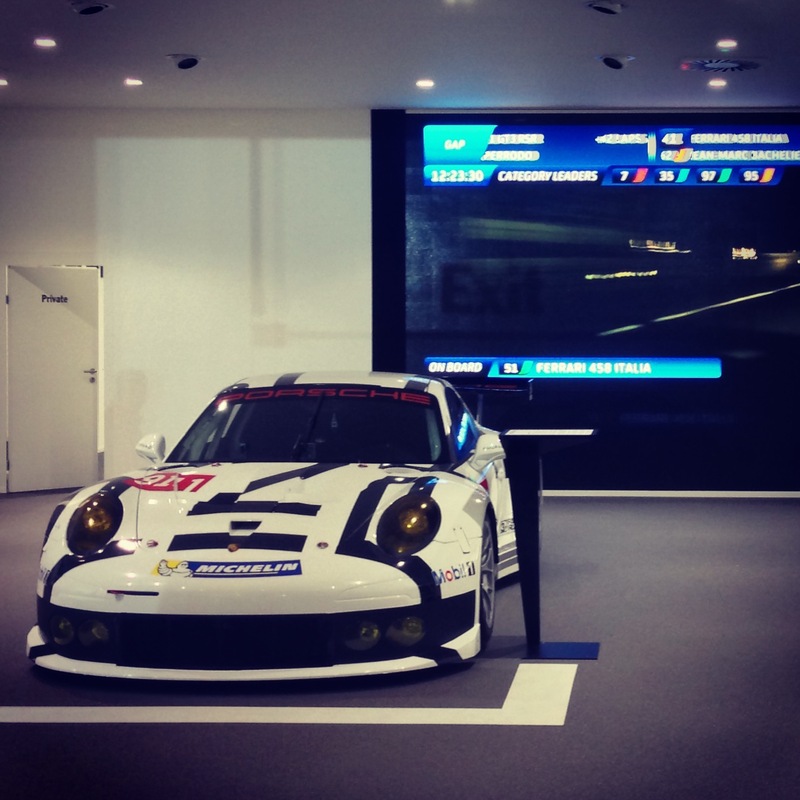 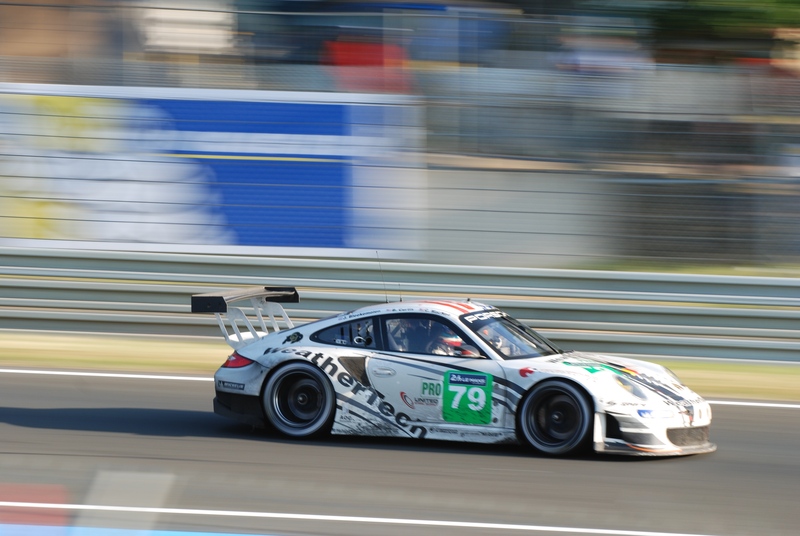 Not to mention Porsche bringing a pair of new 911 RSR’s, competing in the GTE / Pro class. 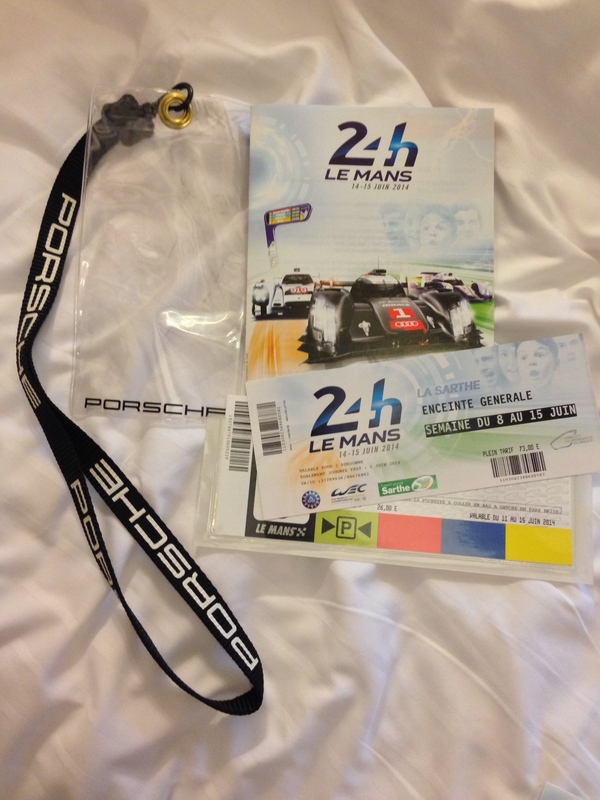 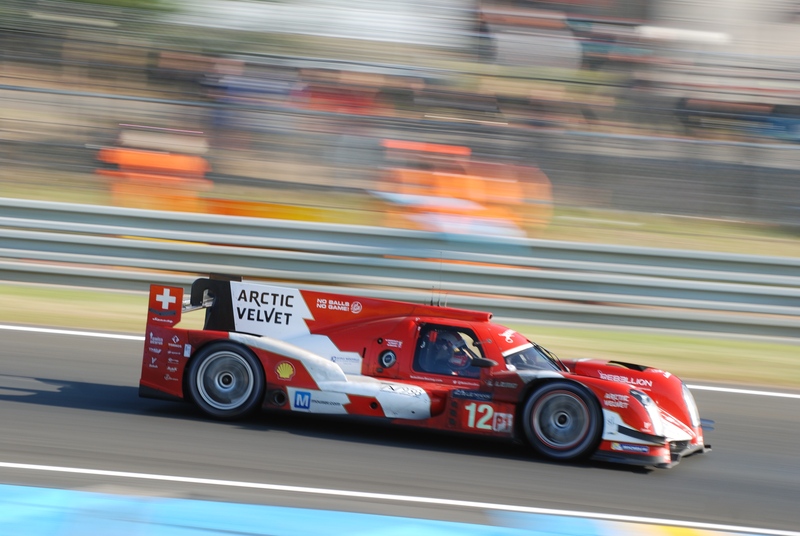 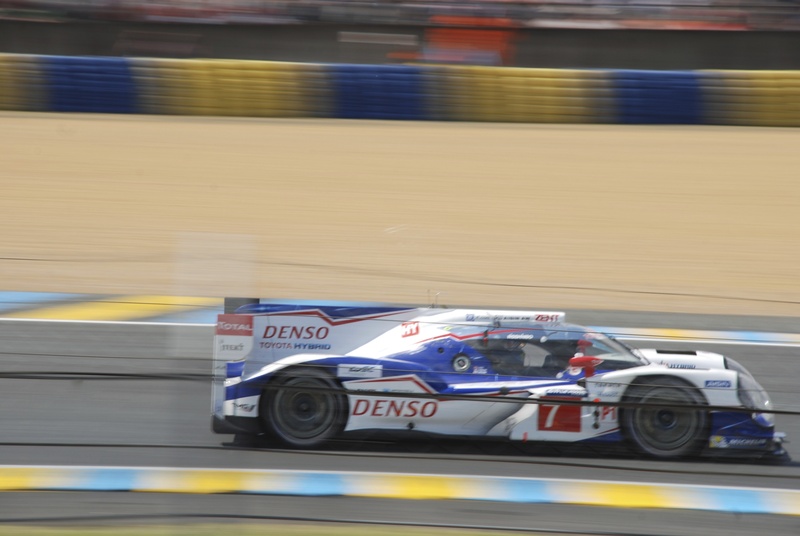 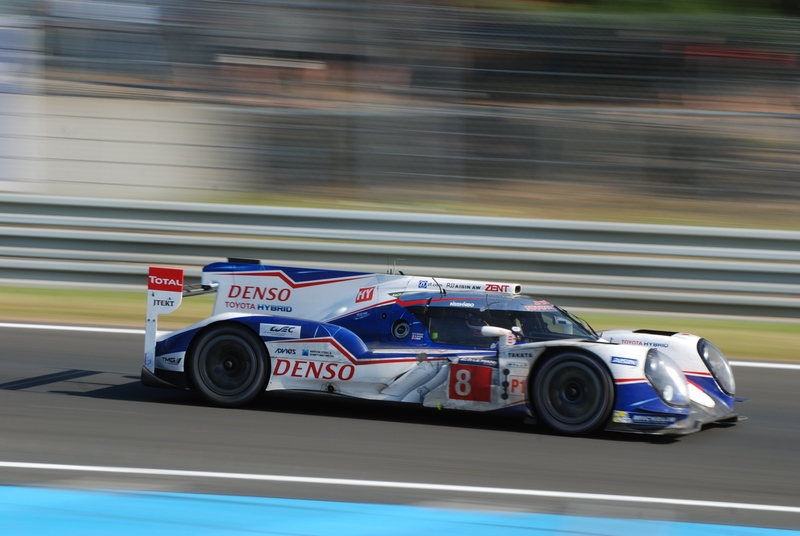 So after a discussion with my wife about planning our vacation for 2014, she quickly agreed on a trip to France, which we would schedule around my attendance at this years Le Mans 24. 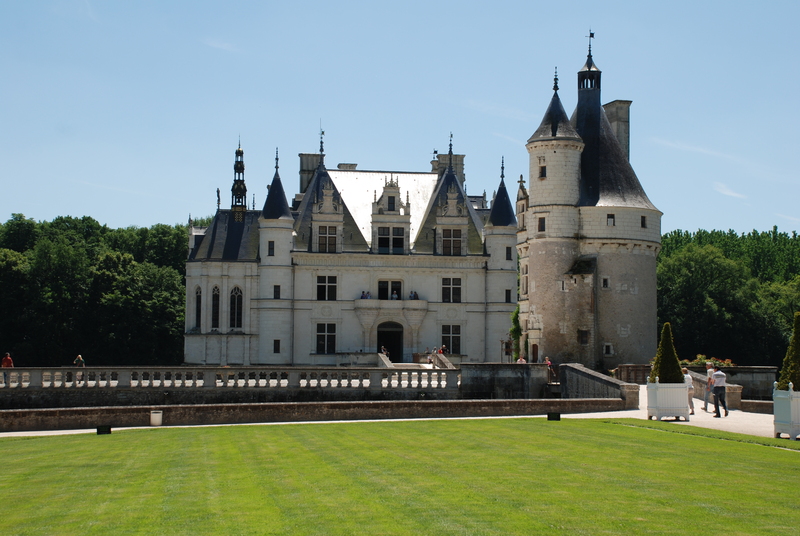 My wife’s sole travel request consisted of being able to travel through France’s Loire Valley, and occasionally stay at a Chateau. 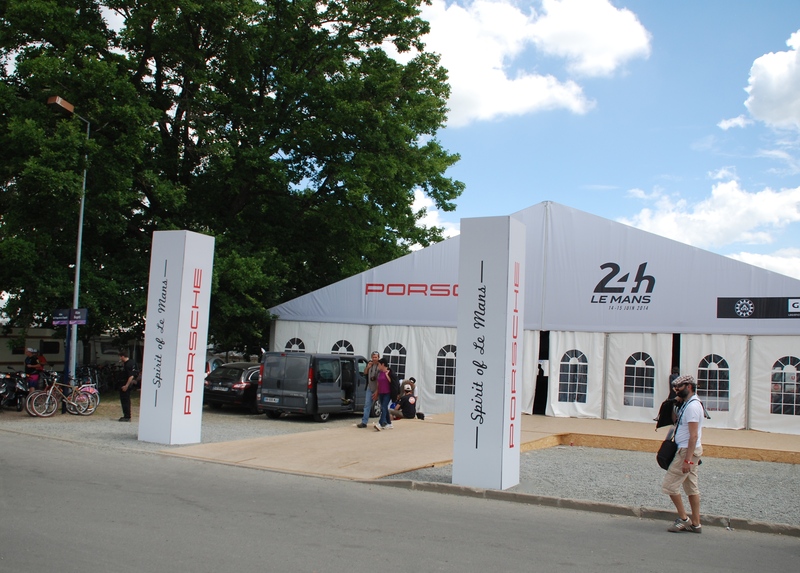 Ironically, Le Mans is roughly located towards the center of the Loire. 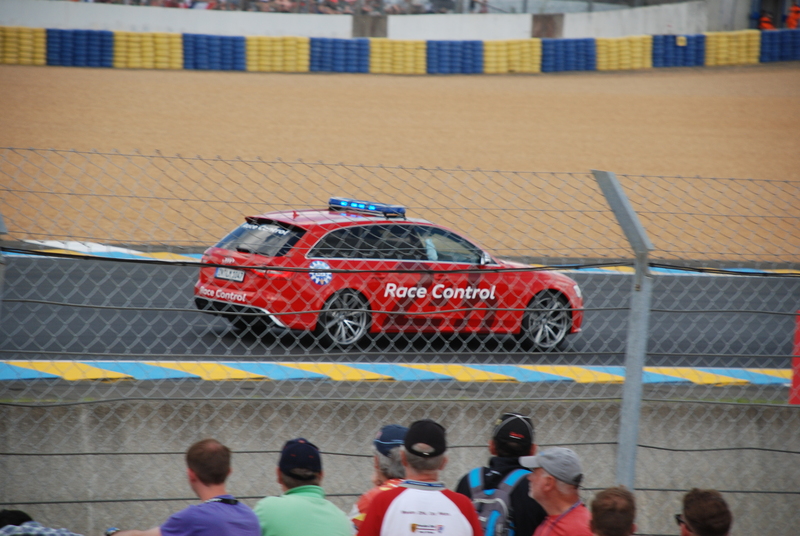 So working with this years race date of June 14-15, 2014, my wife went to work on searching out and booking us at several Chateaus and hotels scattered throughout the Loire Valley. 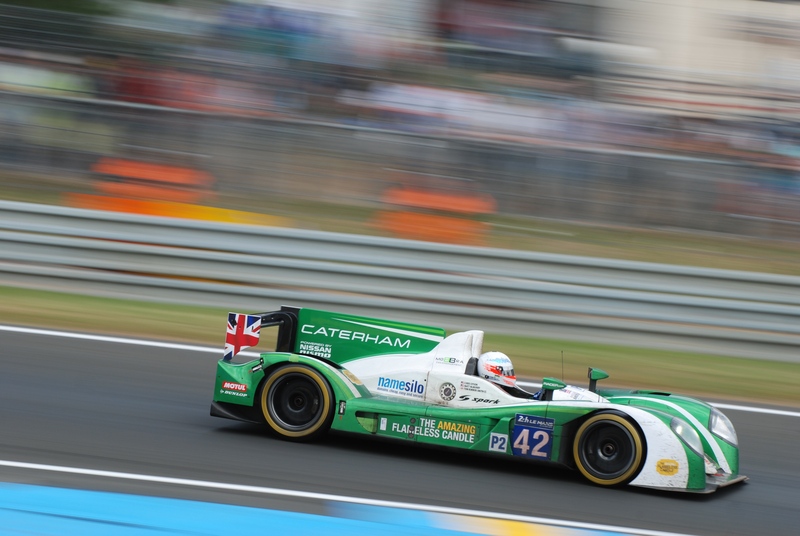 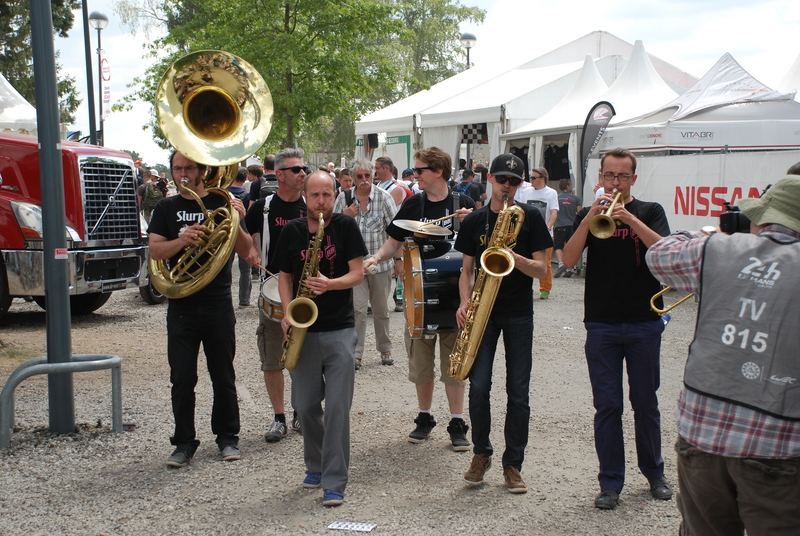 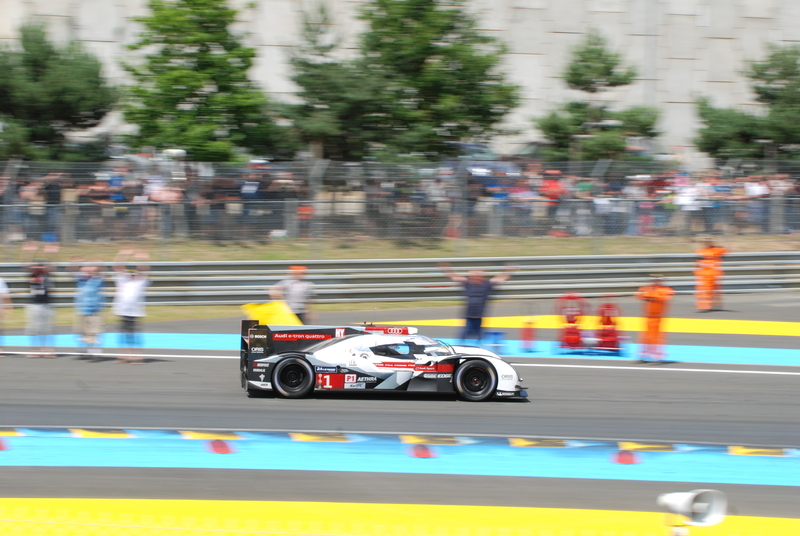 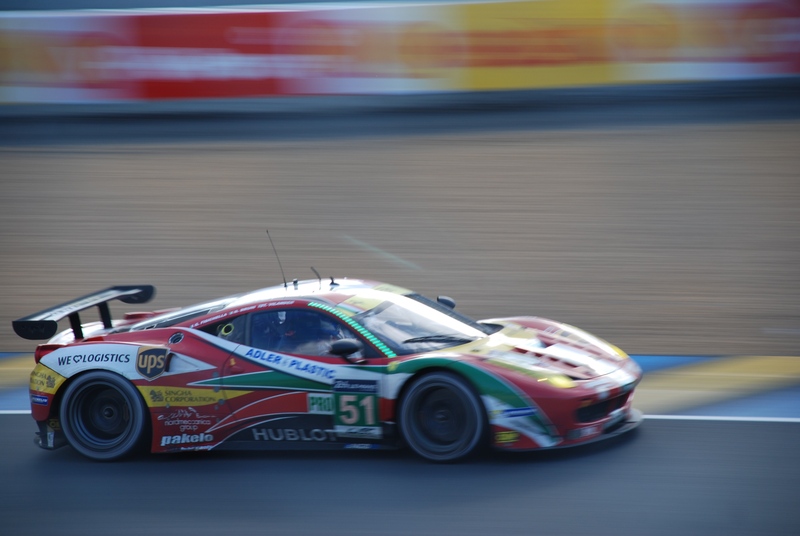 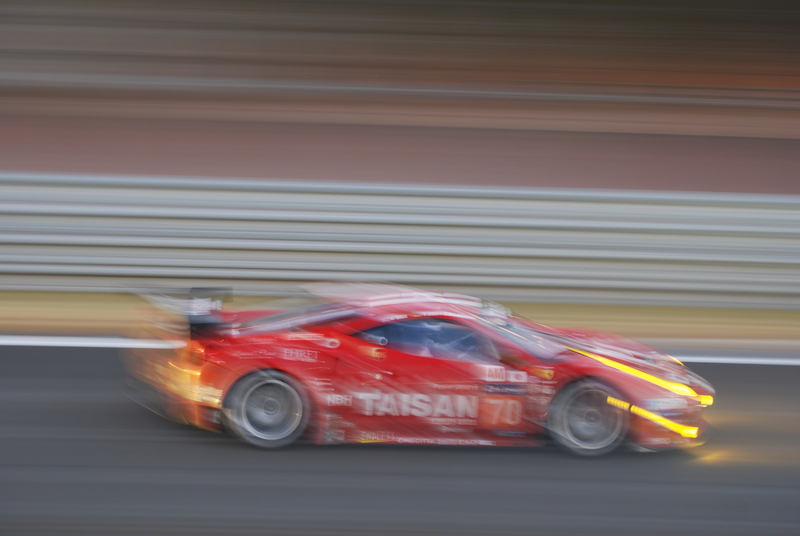 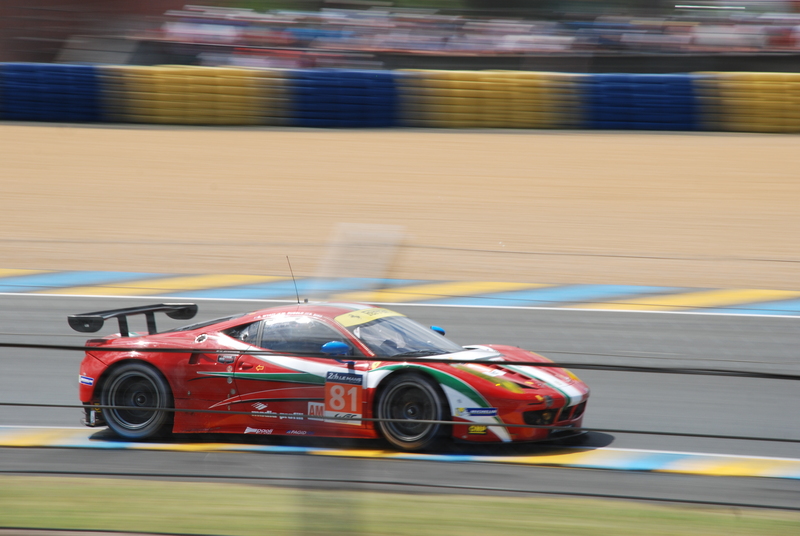 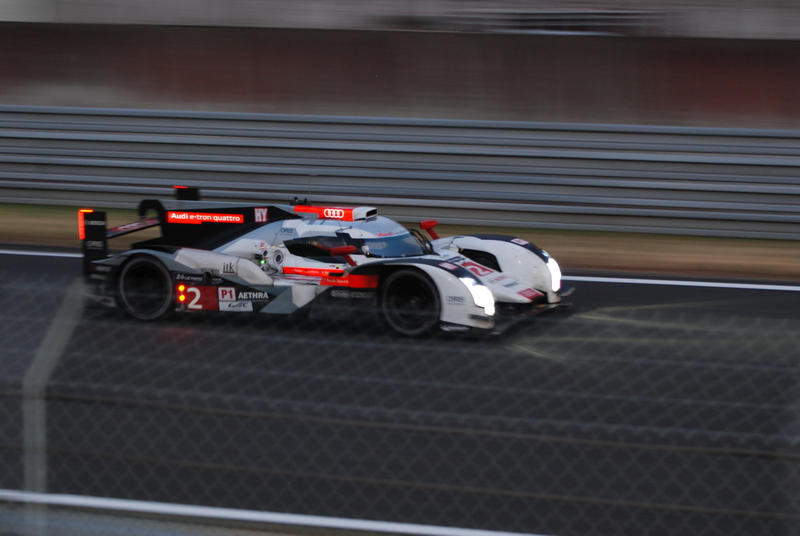 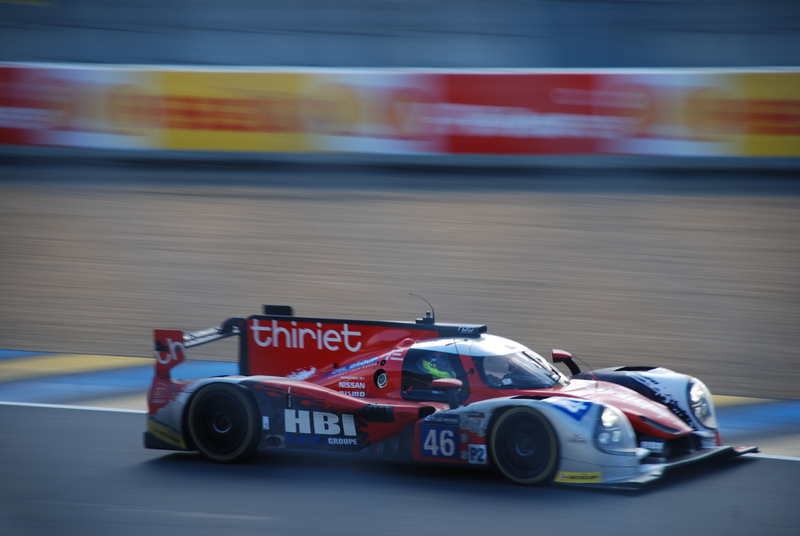 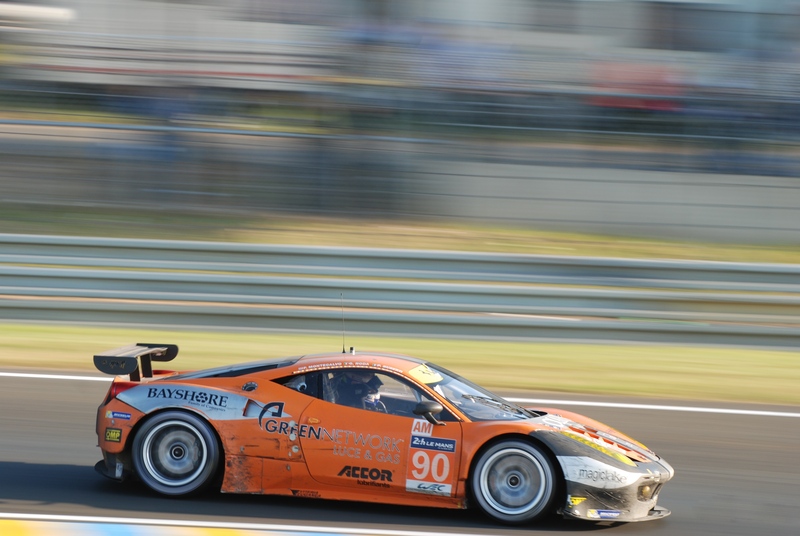 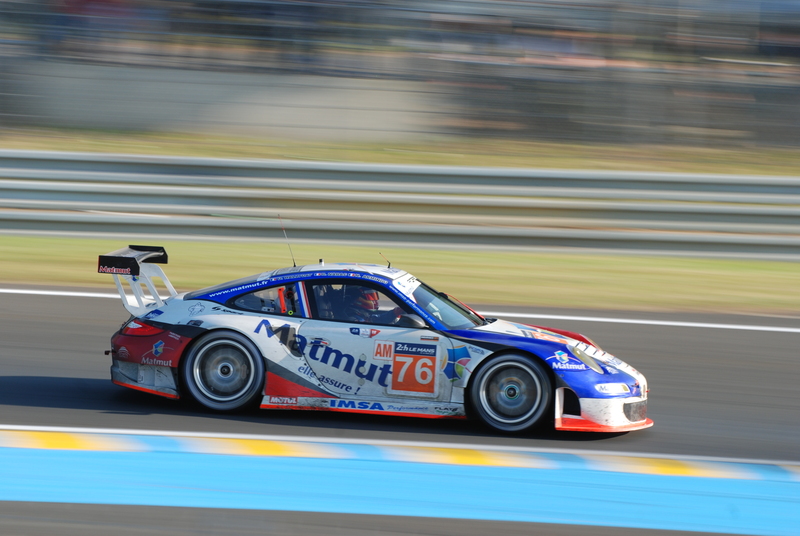 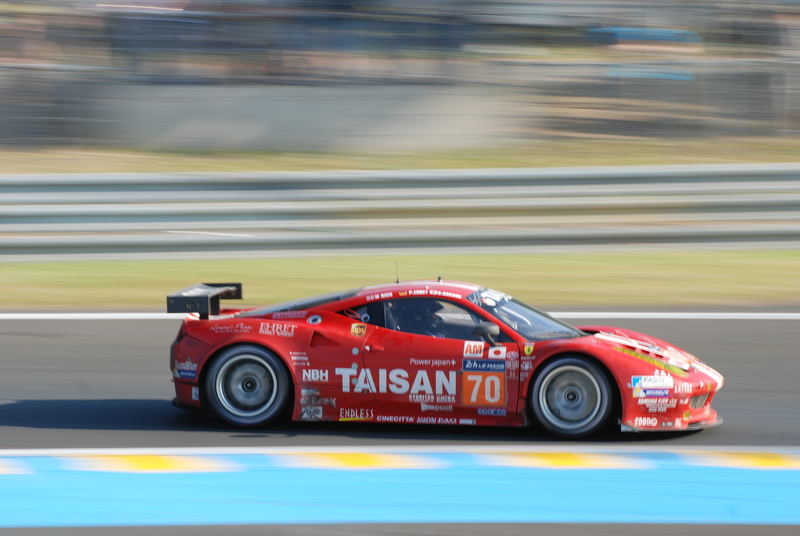 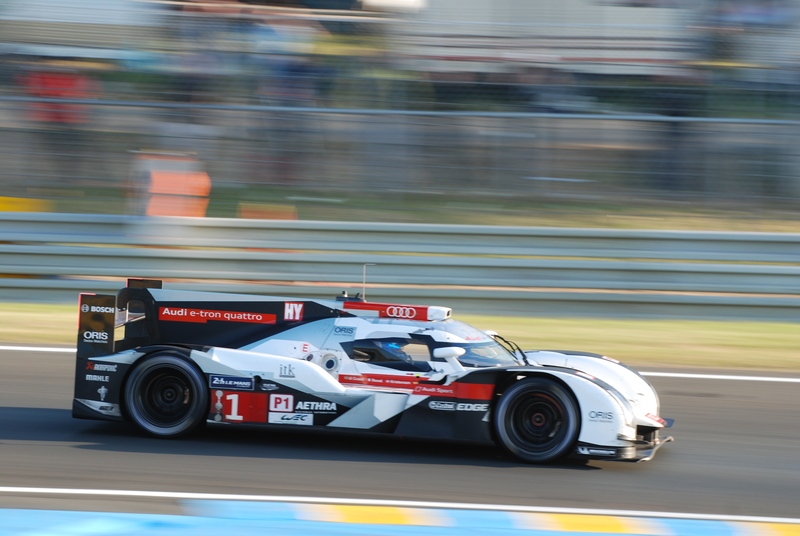 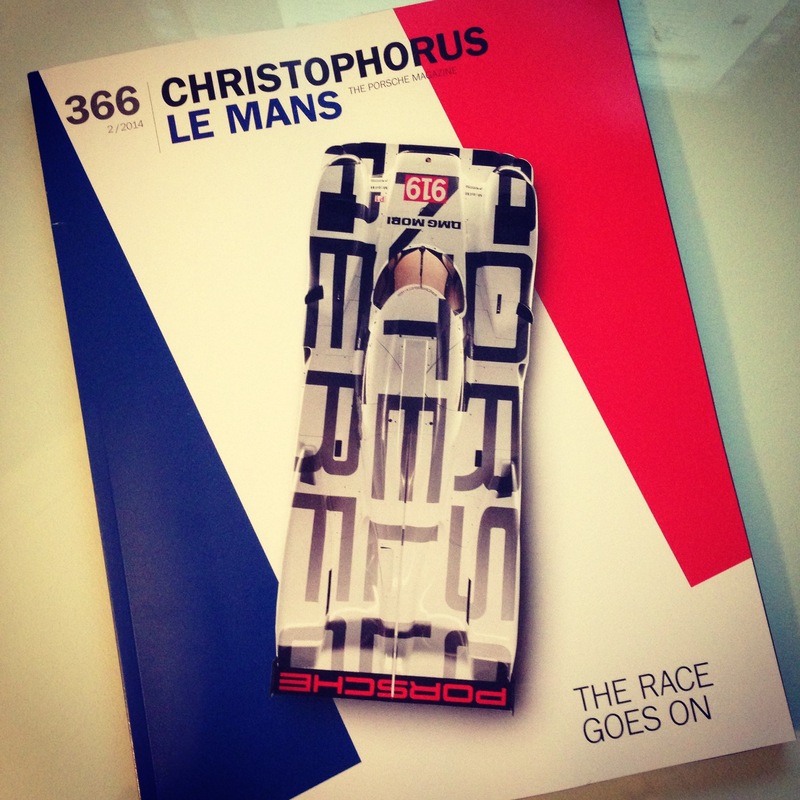 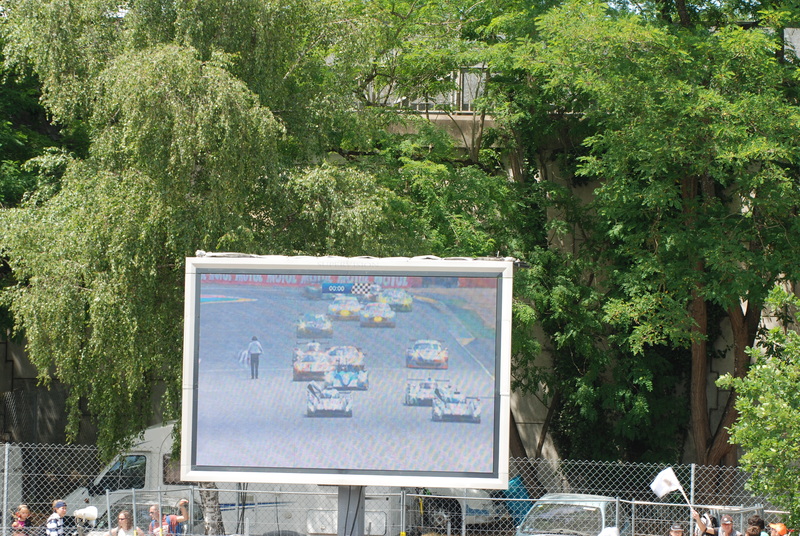 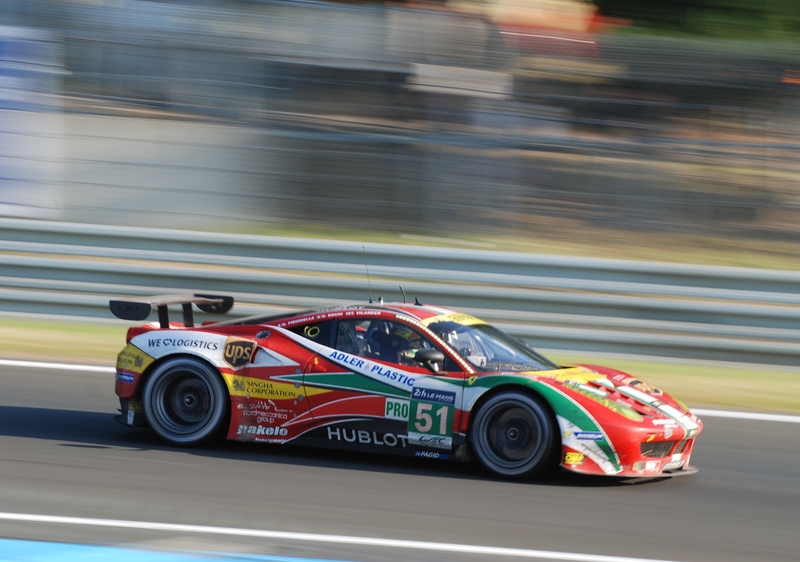 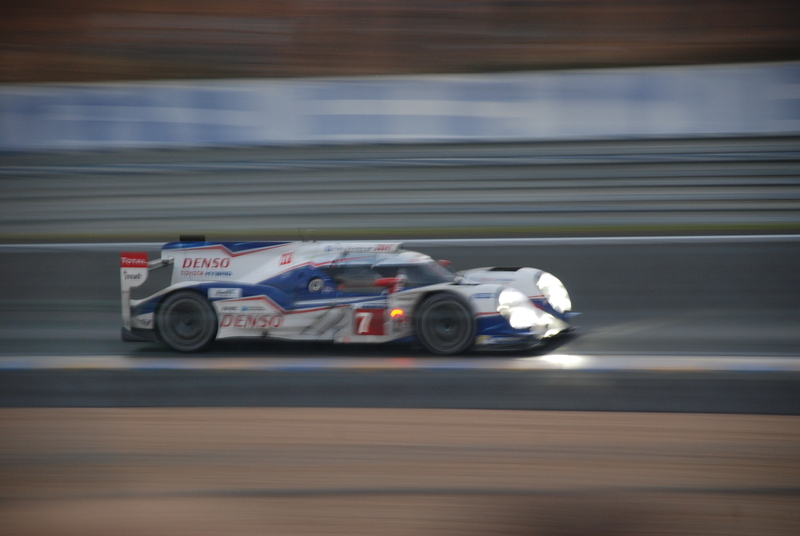 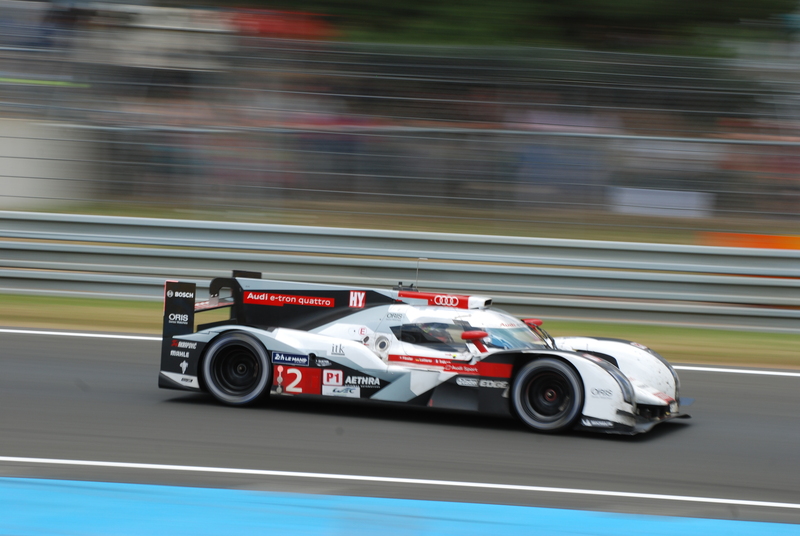 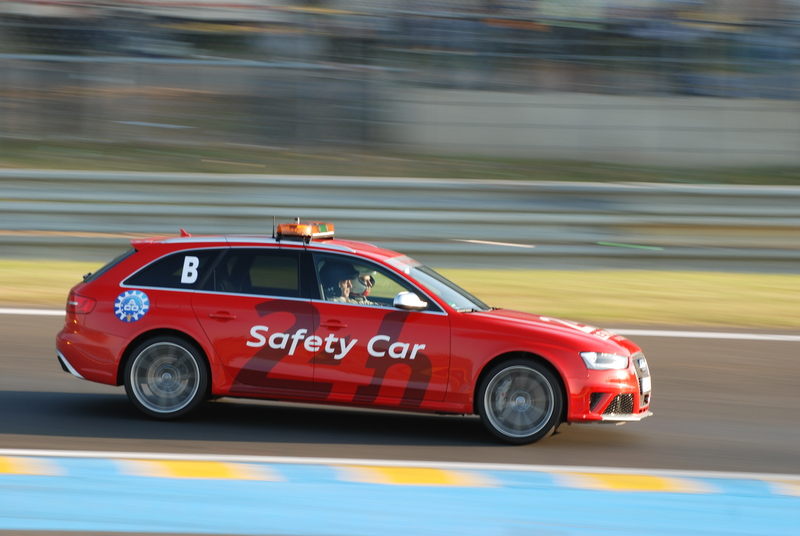 We quickly learned however, that trying to book a hotel in or near Le Mans for 2014 was downright impossible. 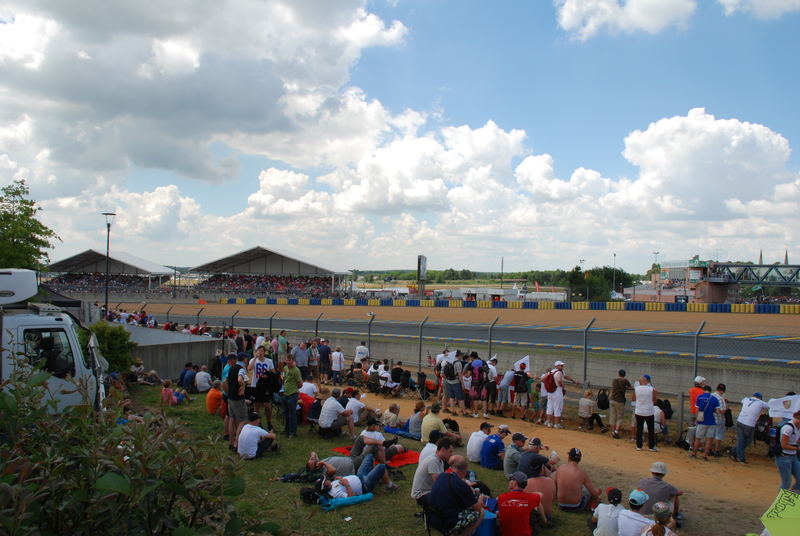 As a back-up plan, we found several chateaus in the village of Amboise, located about 1 -1/2 hours south of Le Mans, each with available rooms. 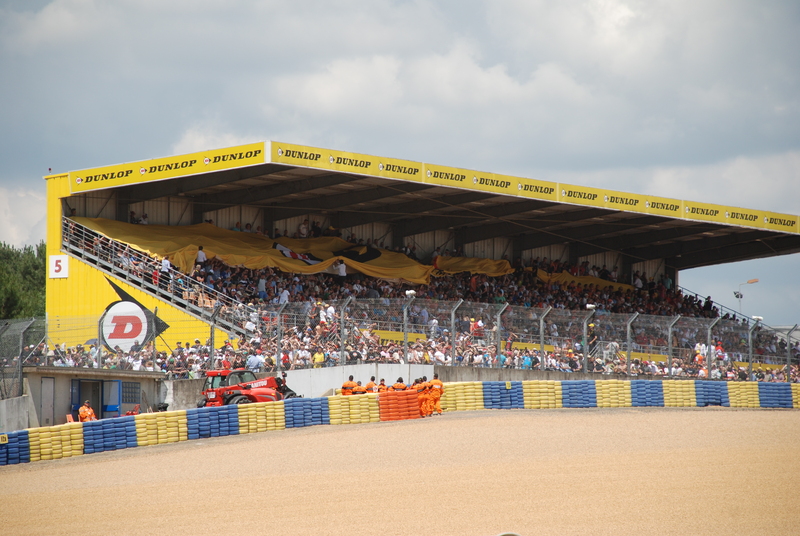 Since I would be attending the race by myself (my wife is not a race fan), she would be staying behind at Chateau #2 (which worked out perfectly), since it was located within walking distance to the town, and good for sightseeing, shopping and dining. 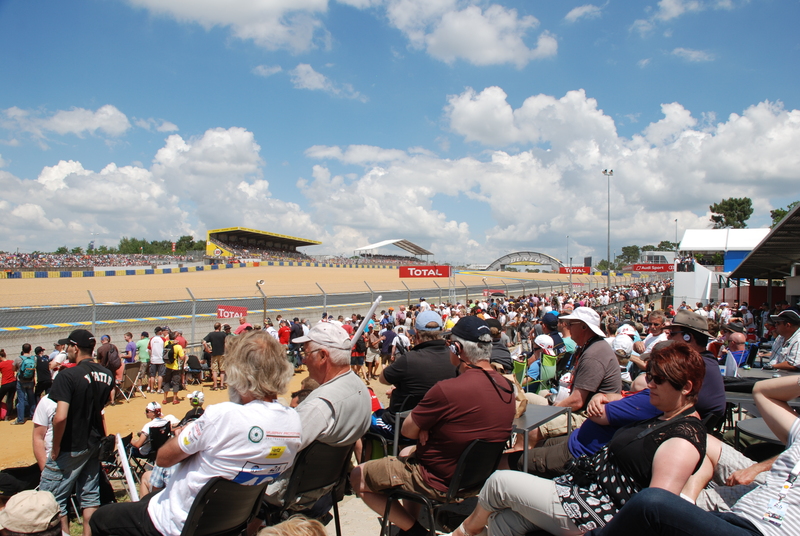 So on June 6, my wife and I boarded our Lufthansa flight to Munich Germany, with a short connecting flight that would deliver us to our final destination, the Charles De Gaulle airport in France. 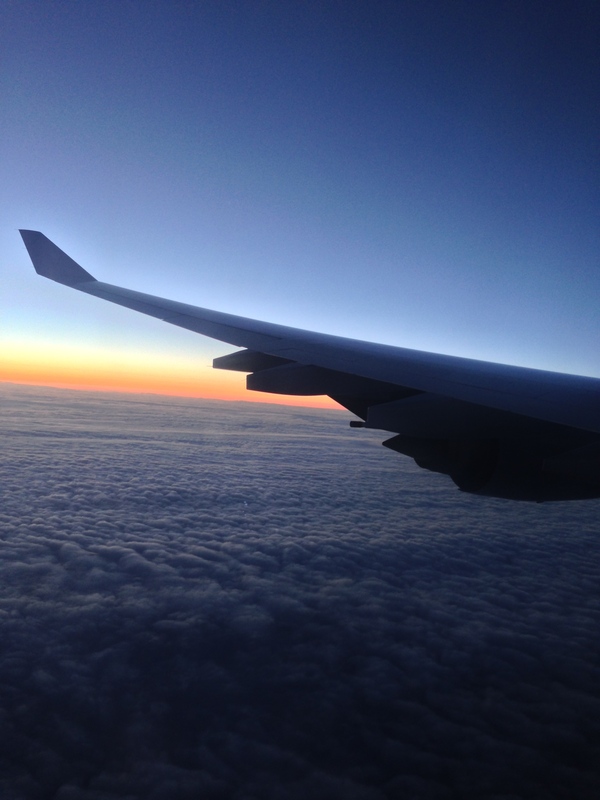 Below, sunset over the polar route, on our way to Munich, Germany. 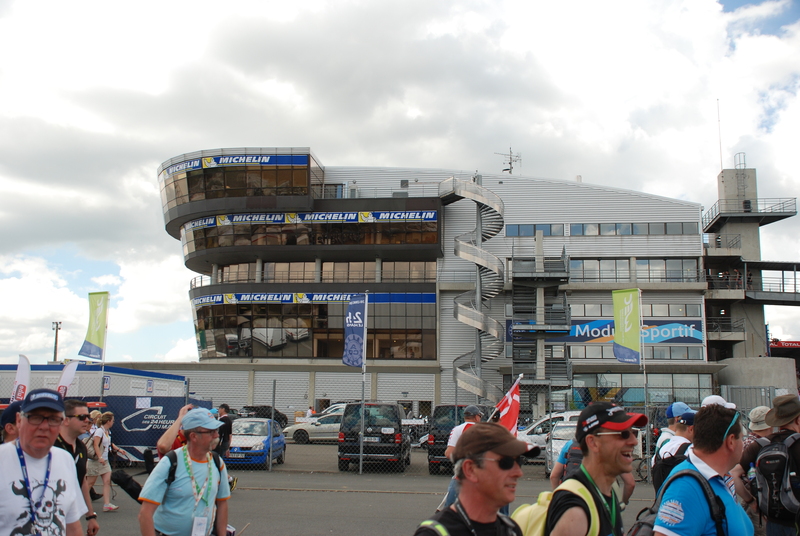 We arrived in Munich on schedule, and after a brief lay over, were on our way to the Charles De Gaulle airport, located about 45 minutes to the east of Paris. 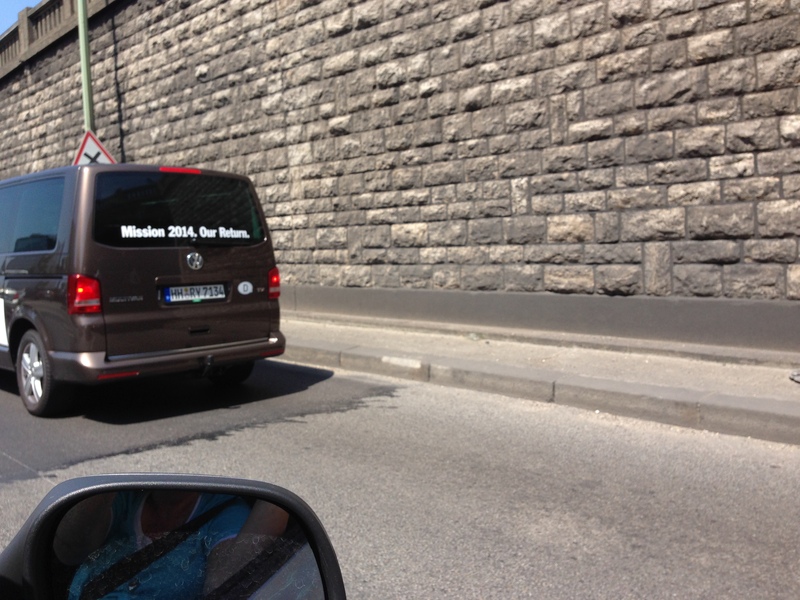 After collecting our luggage, we picked up our rental car from the company Sixt. 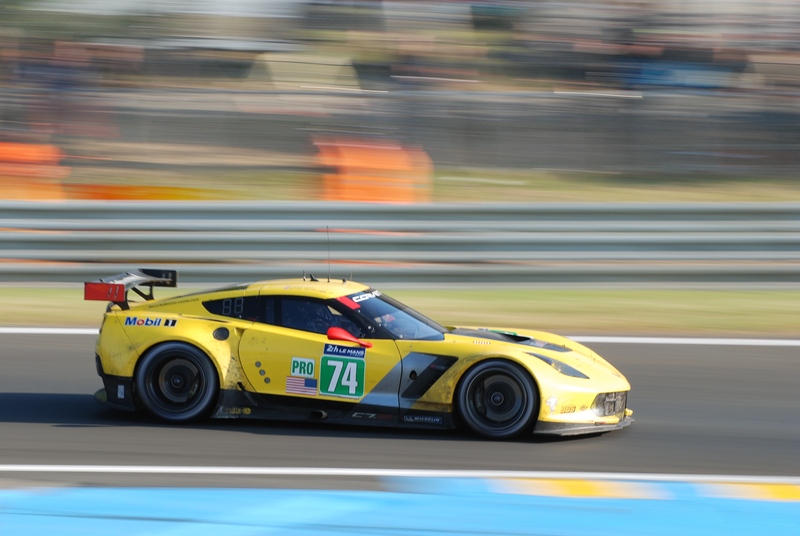 ( should anyone be planning a trip to France, I would highly recommend this rental car company). 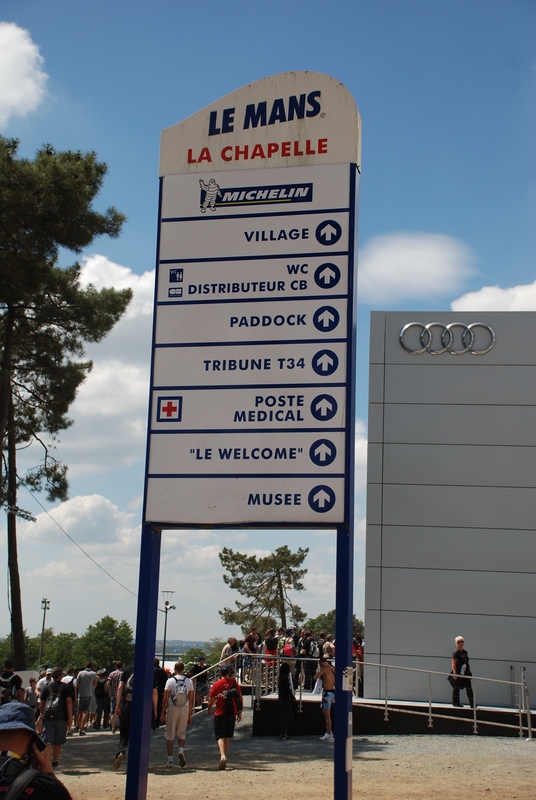 Even though we came prepared with our Michelin maps for navigating France, our car came equipped with navigation, which proved to be invaluable during our trip. 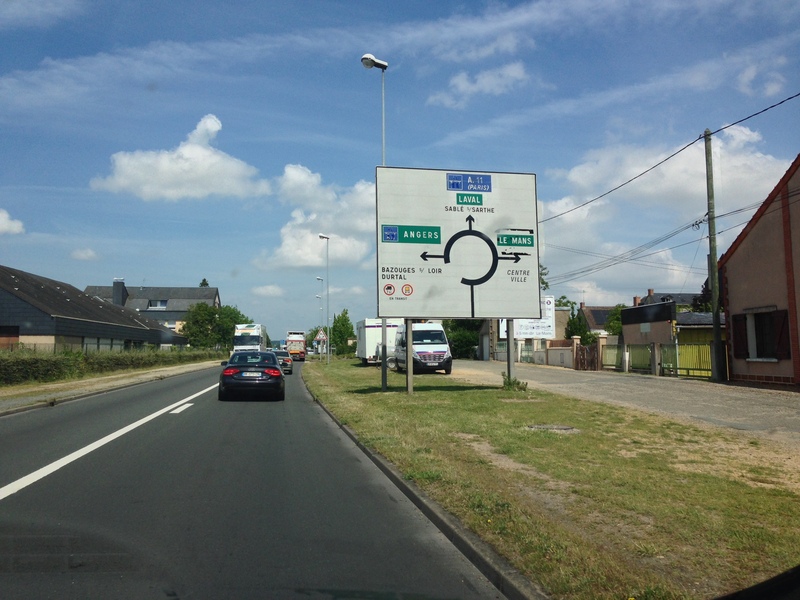 After programming in our first destination, and adjusting the language section to english, we were off to the Marne La Valle area, where we would be staying at a friend’s home. 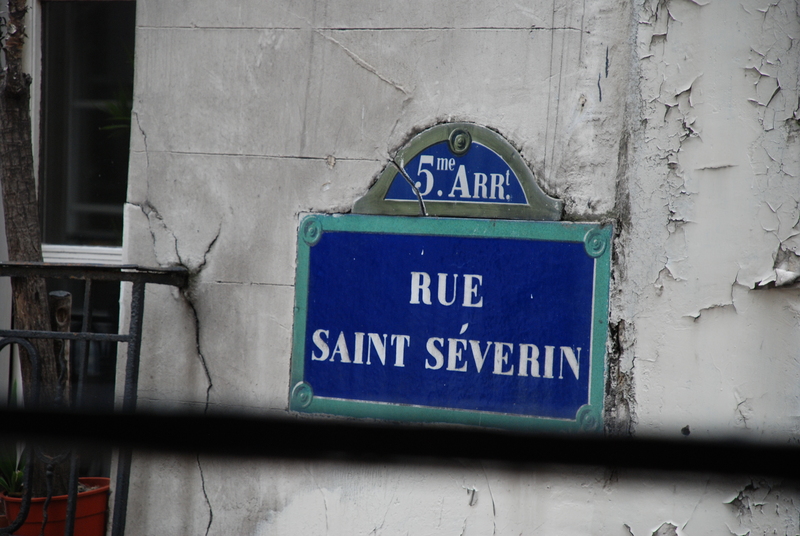 For our first couple of days we traveled into Paris, revisiting some of our favorite districts and landmarks. 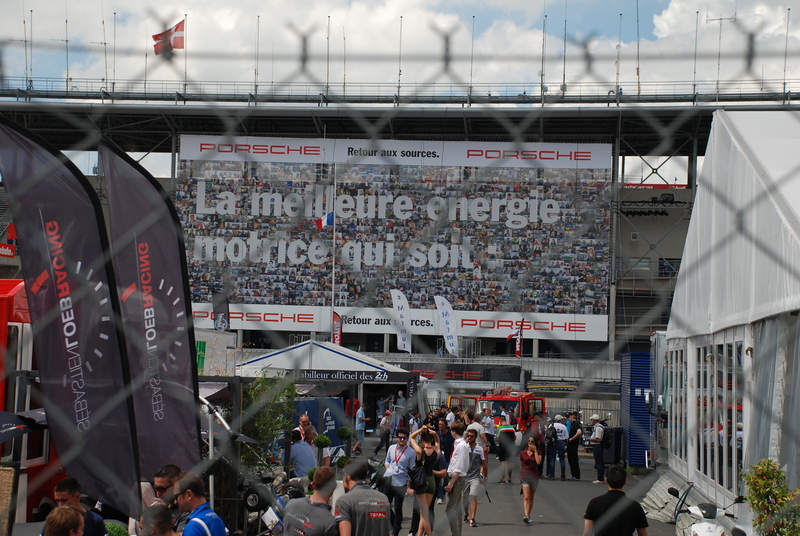 We had lunch at one of the many sidewalk bistros in the 5th district; the photo below was shot through the bistro’s open window. 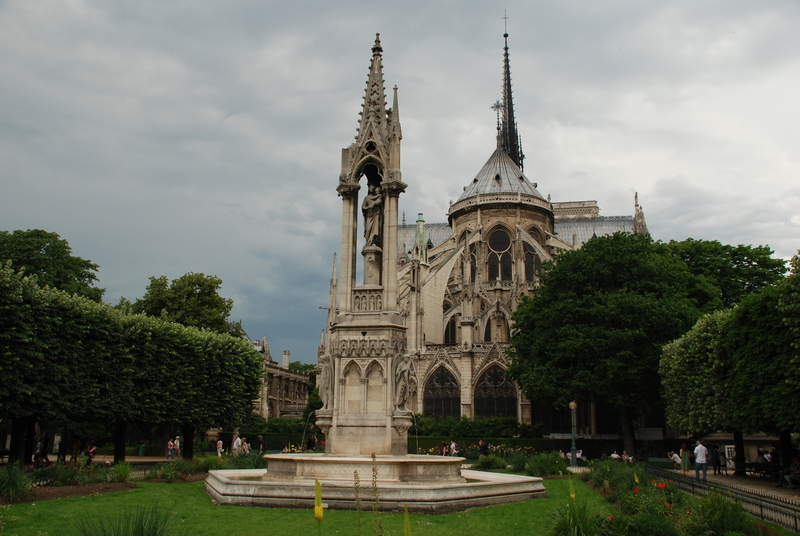 After lunch, we walked back across the Seine, and made our way over to the second most recognizable landmark within Paris: Notre Dame. 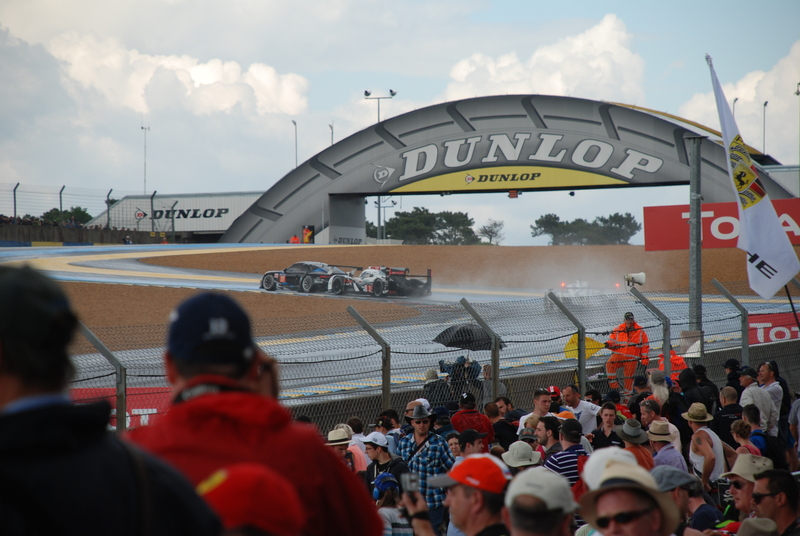 By the time Thursday rolled around, it was time for us to load up the car and head out towards Paris, then detour south towards the village of Amboise. 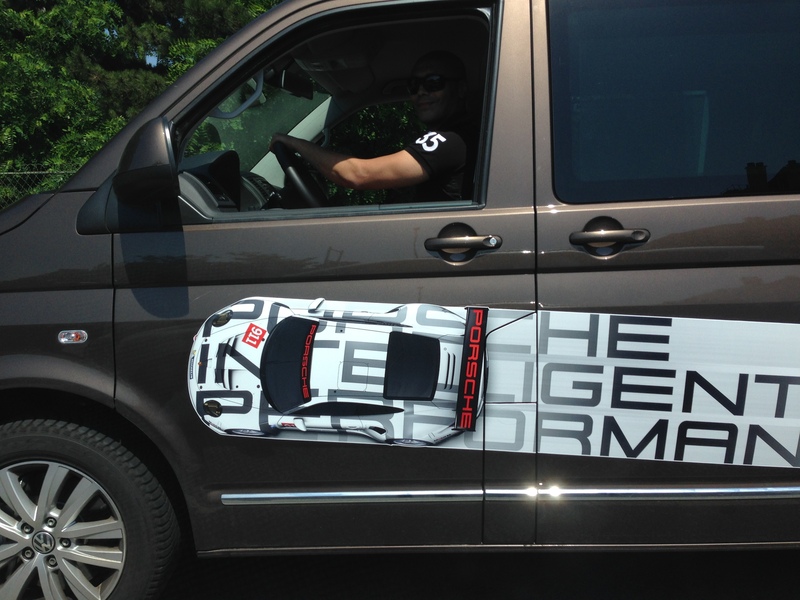 Imagine our surprise at encountering the vehicles seen below, also heading south. 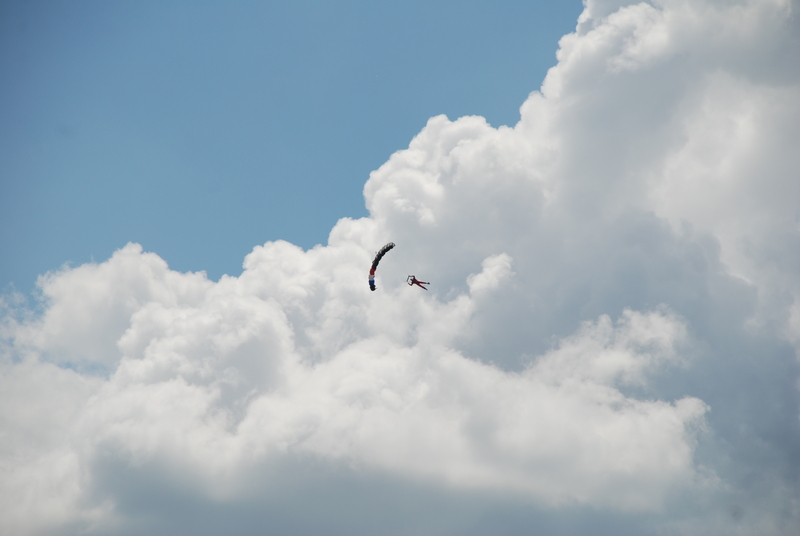 Any thoughts as to their destination? 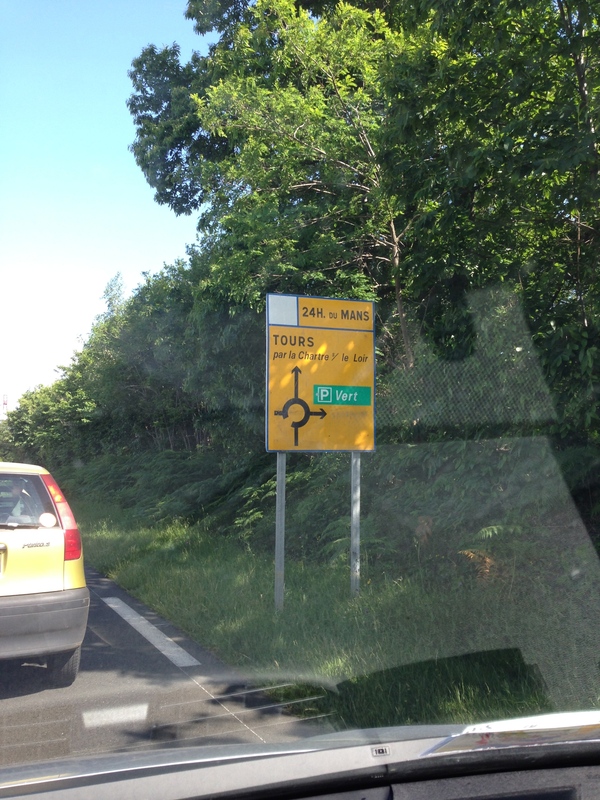 After giving them a thumbs-up as we passed, we continued south towards our final destination. 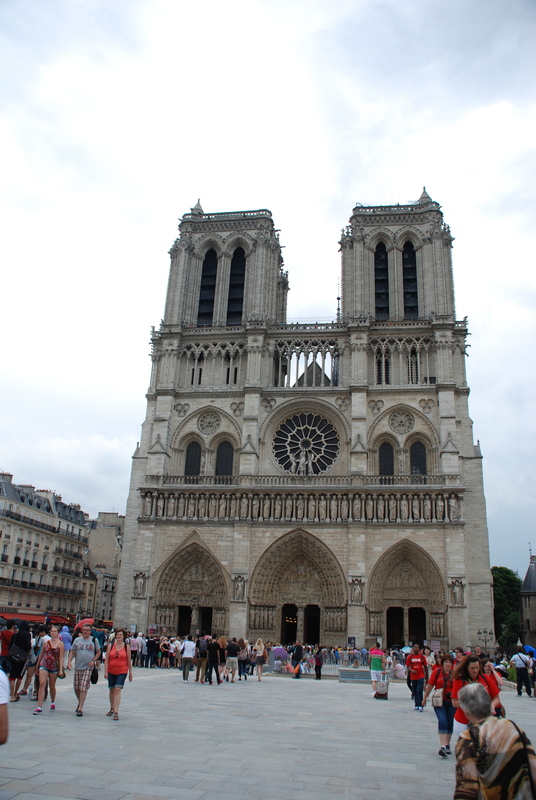 Our next stop however would require a slight detour, to another of France’s architecturally significant Cathedrals; Chartres. 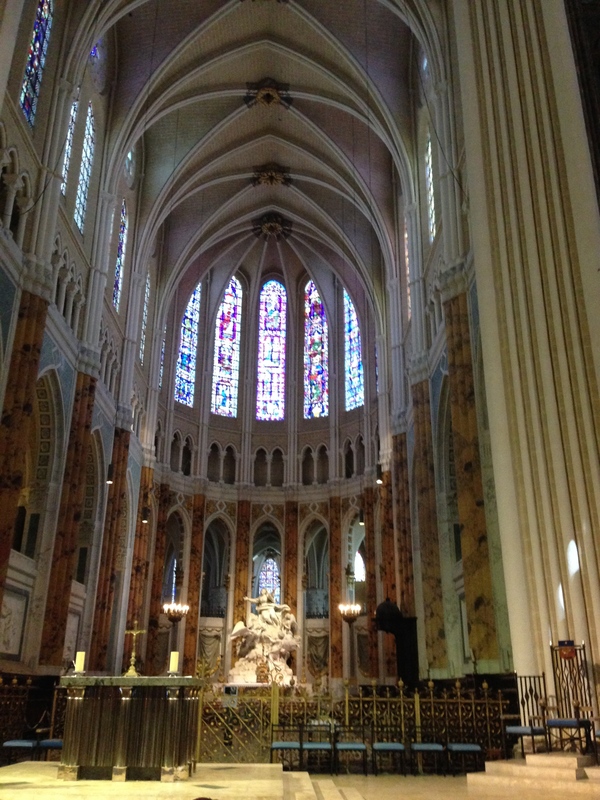 Since my wife had never visited Chartres, we decided to stop for a quick tour (this would mark my third visit). 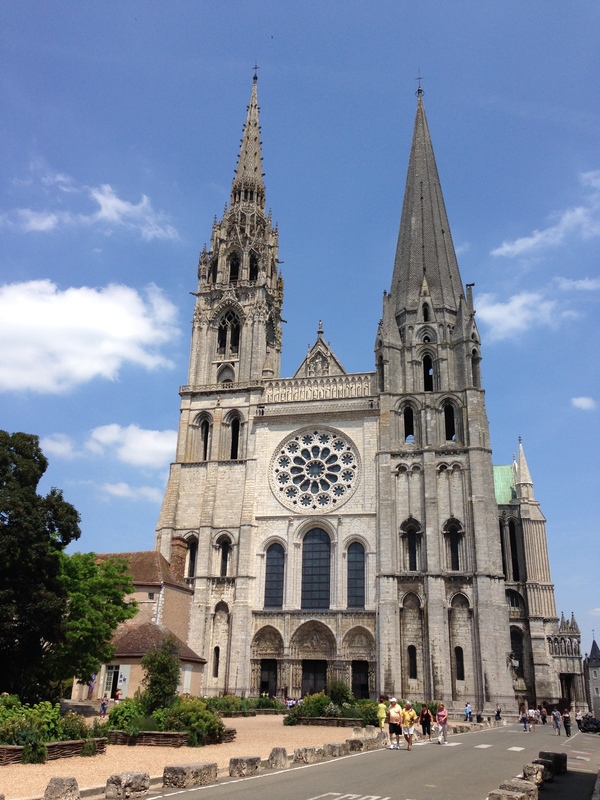 Our brief stop was well worth the time spent; Chartres immediately became one of my wife’s new favorite Cathedrals in France. 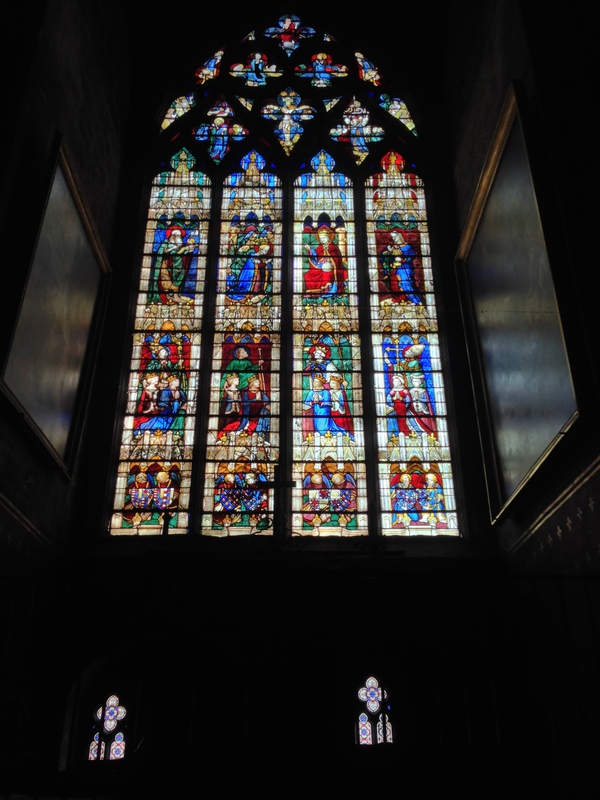 And as the photos illustrate, the interior of the cathedral was undergoing a full restoration, with a high percentage of the walls, ceilings and stained glass windows having recently been restored, with the remaining areas still awaiting their turn. 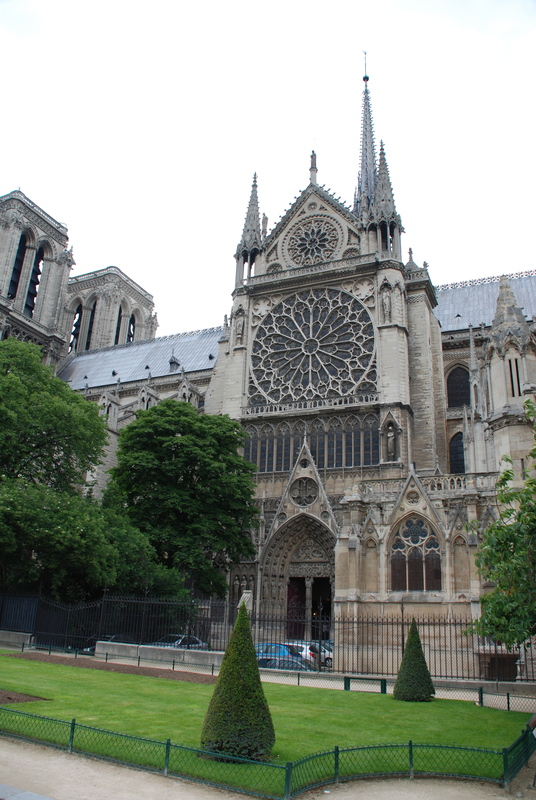 (Definitely a brighter appearing interior, and beautiful, vibrant leaded glass windows, noticeably improved over my last visit 12 years ago). 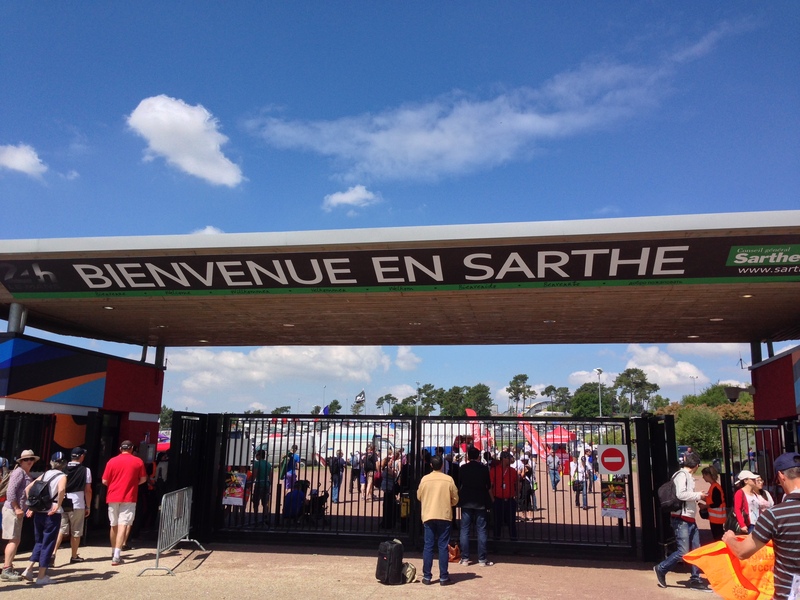 Once back on the road we continued south, and several hours later finally arrived at our destination in Amboise, despite one major road closure that sent us on a one hour detour. 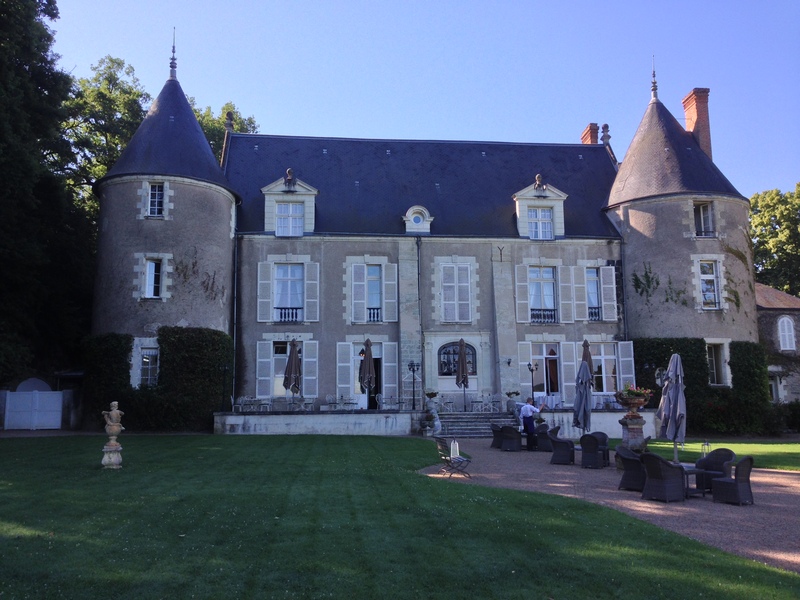 Amboise would become our new home base through the weekend, and for the next two days, residence at the 750 year old Chateau de Pray (below). 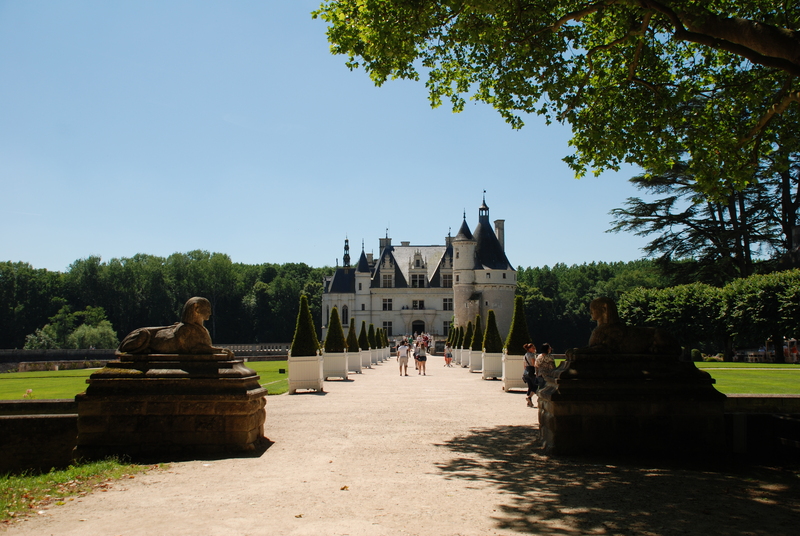 On Friday morning, we ventured out to visit the nearby 16th century Renaissance palace, Chateau de Chenonceau (as seen below). 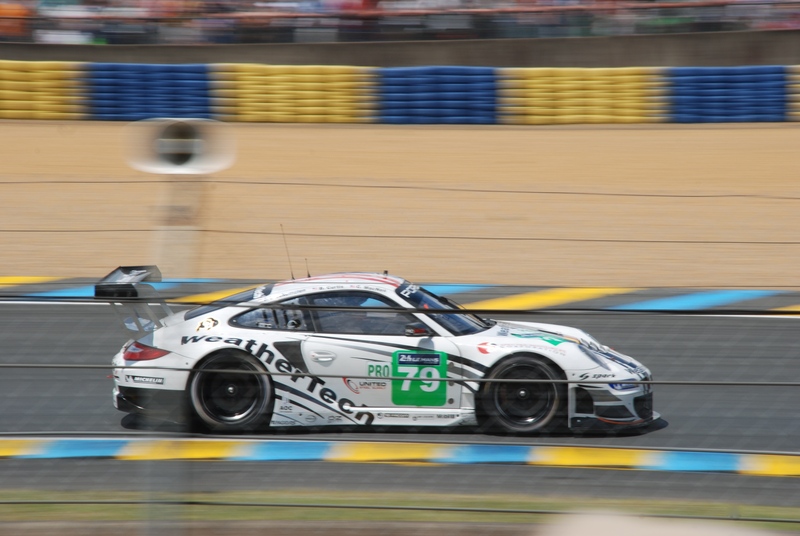 Chateau de Chenonceau is reported to be the most visited Chateau in all of France, and given its sheer size, spectacular location, architectural and interior details as well as its history, it was easy to understand the attraction. 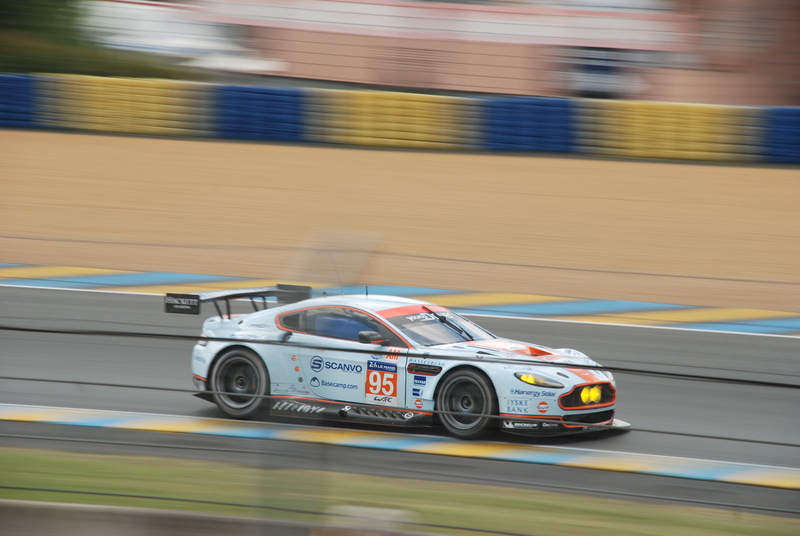 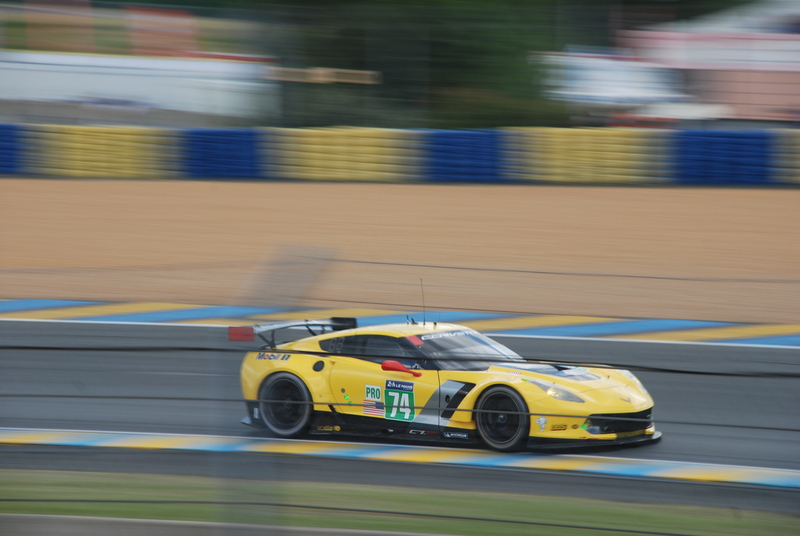 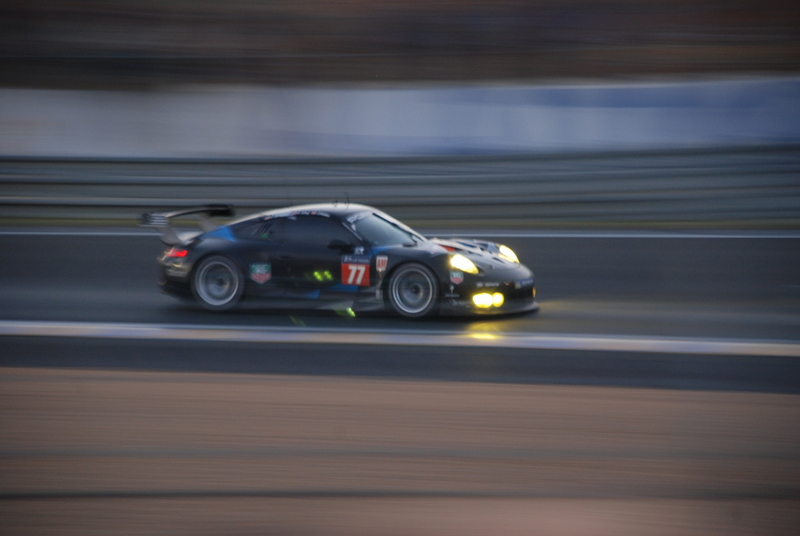 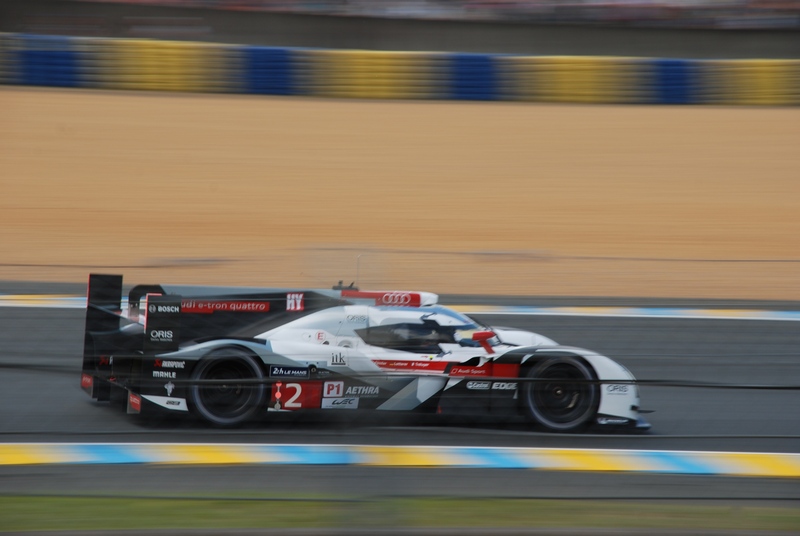 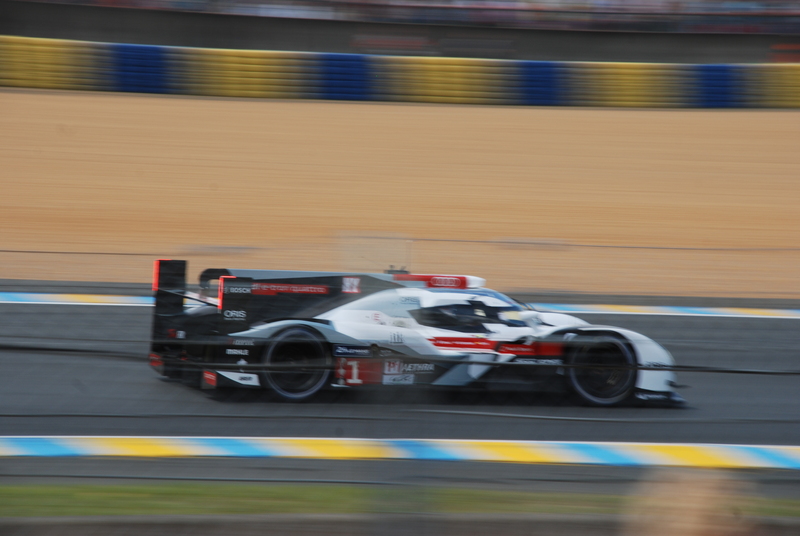 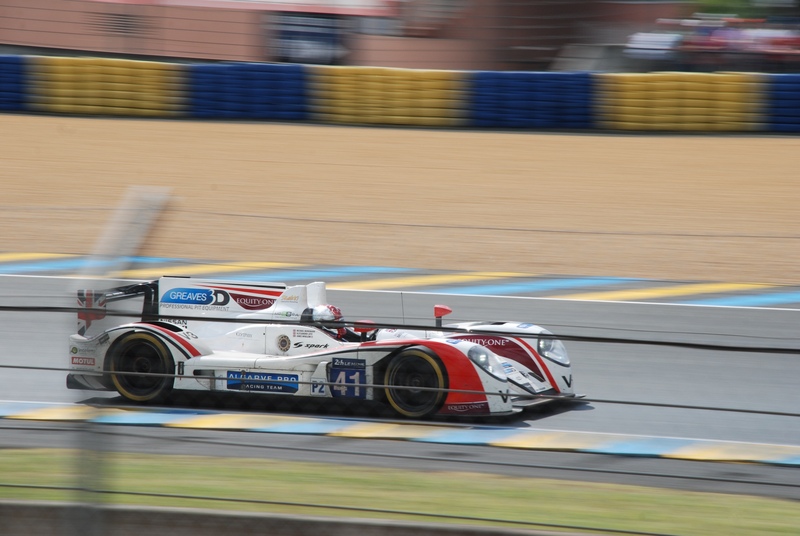 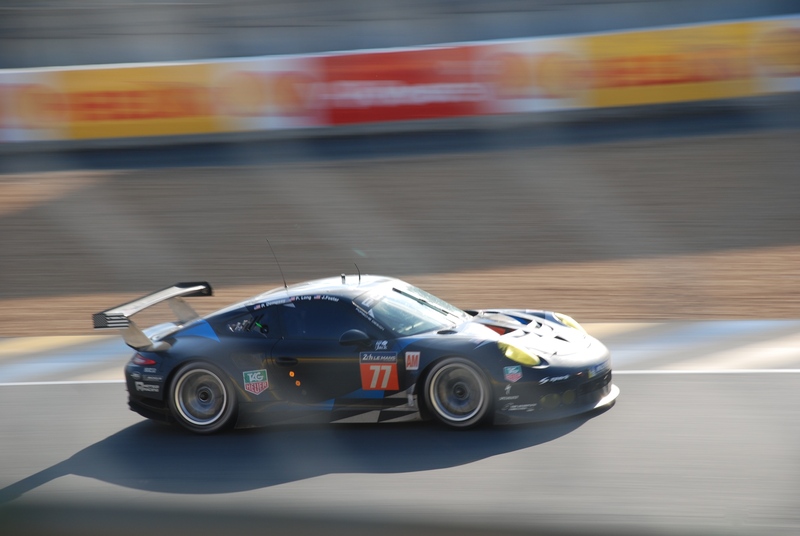 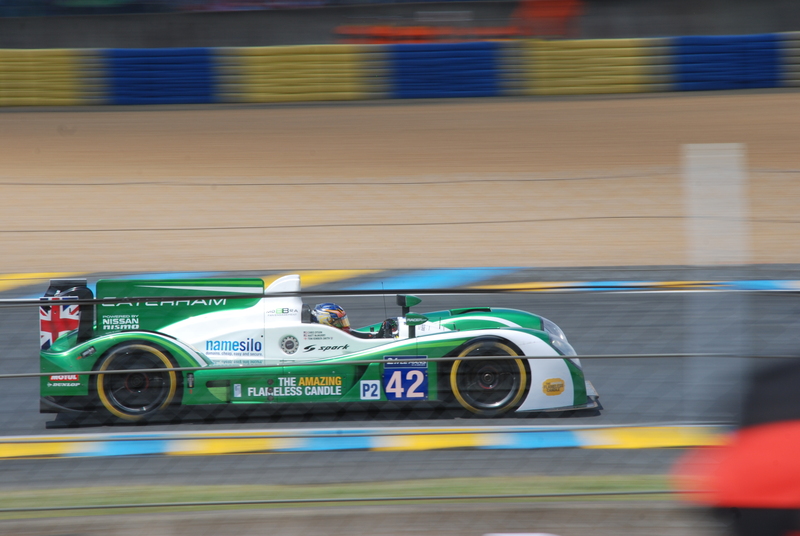 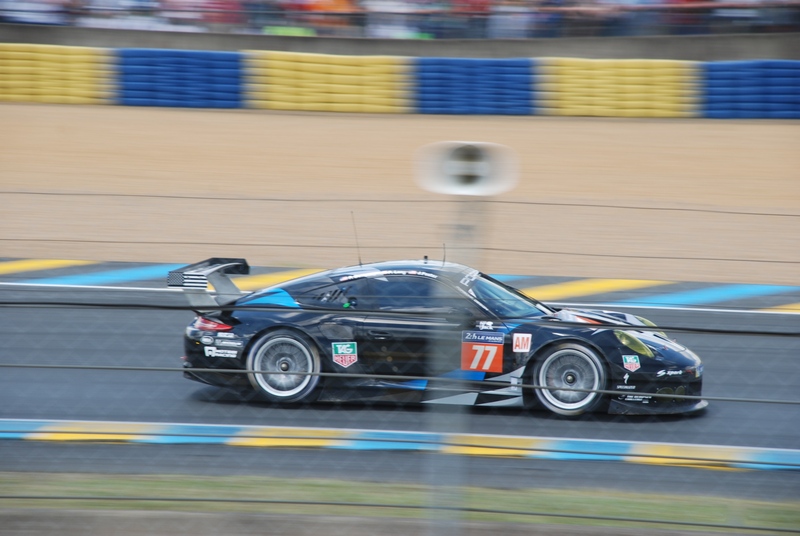 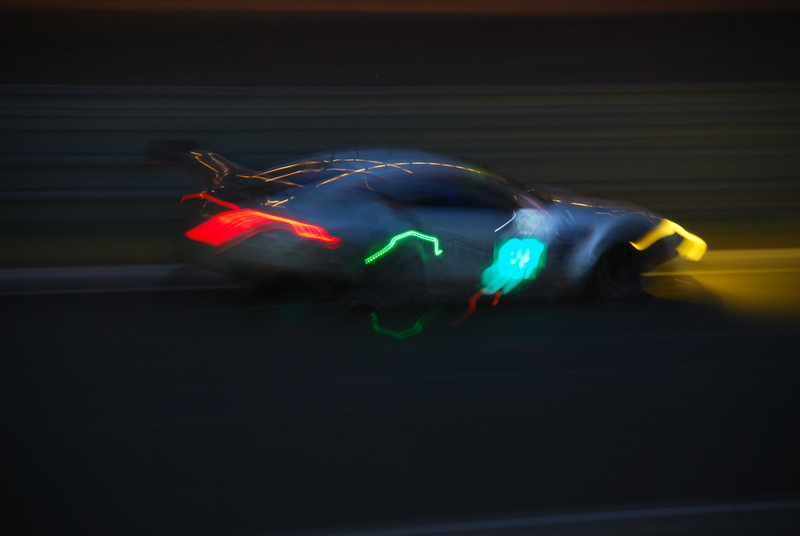 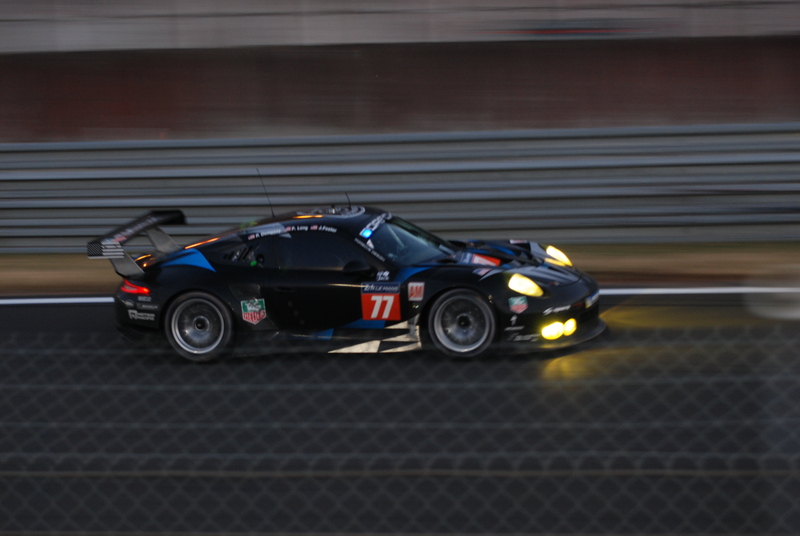 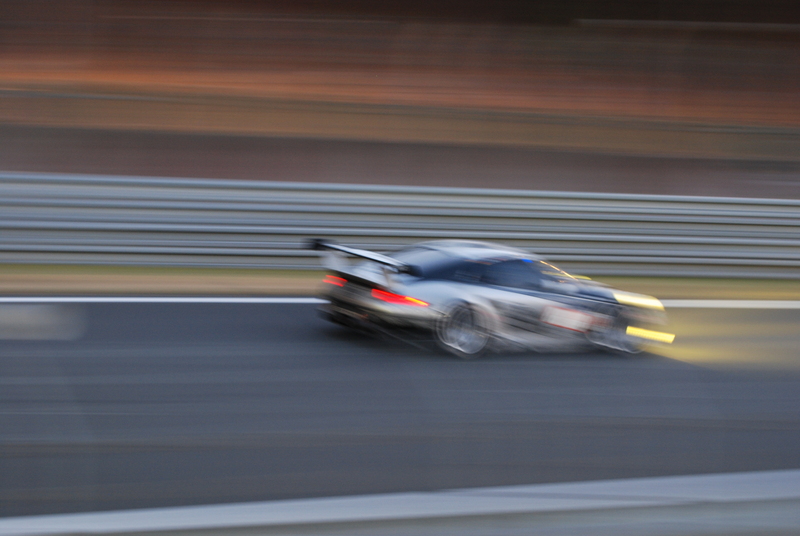 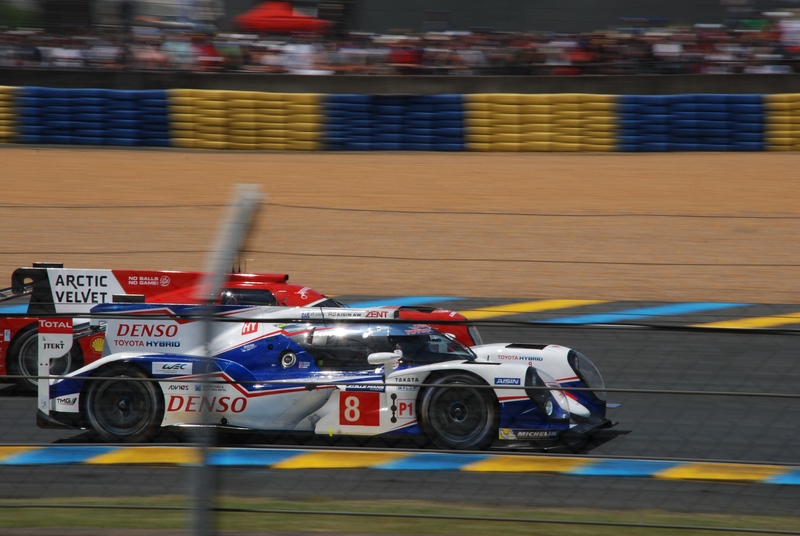 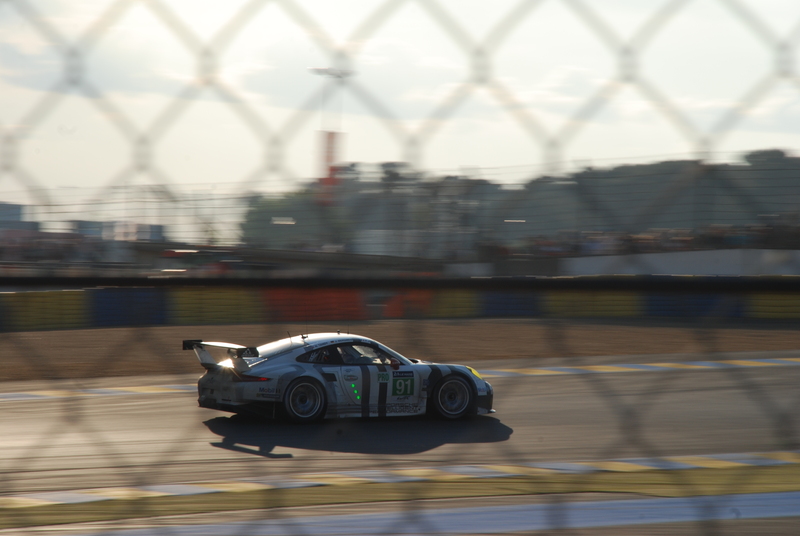 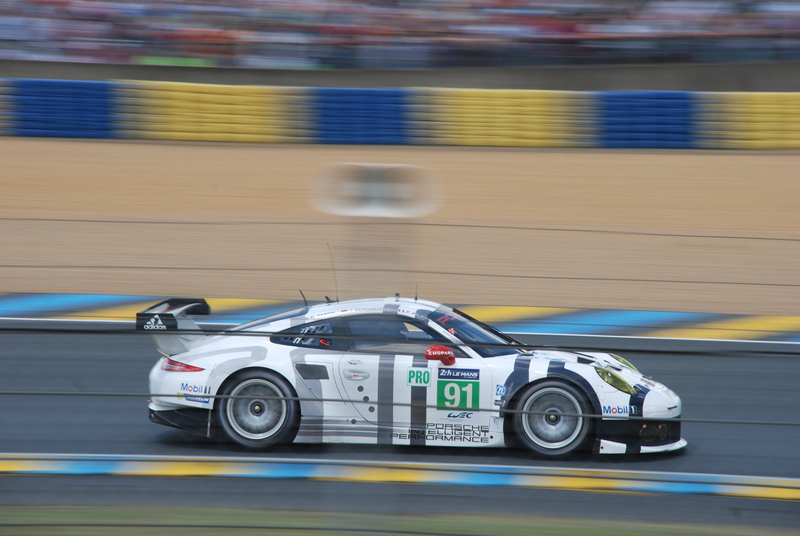 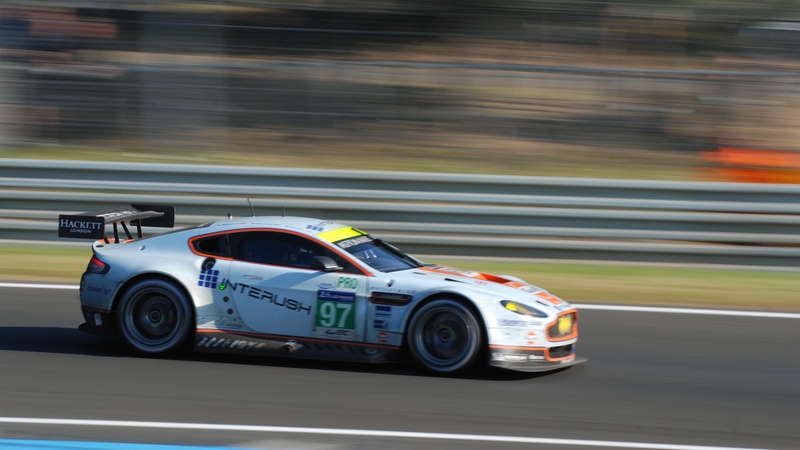 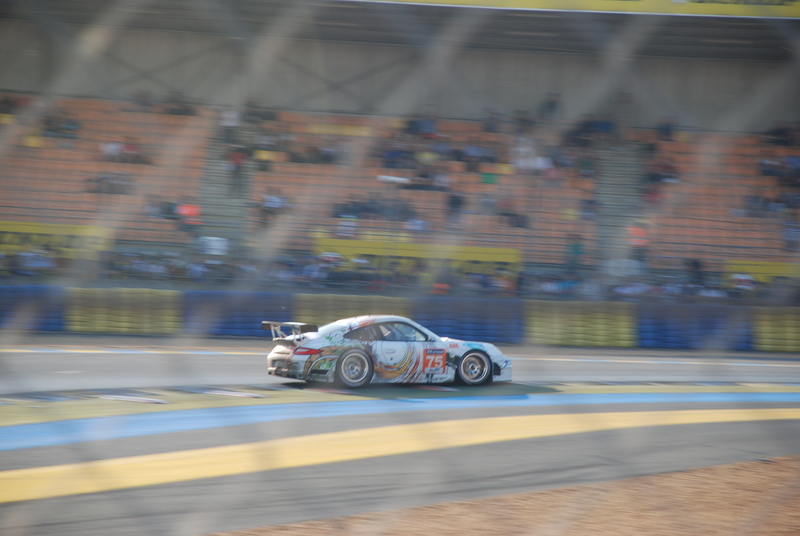 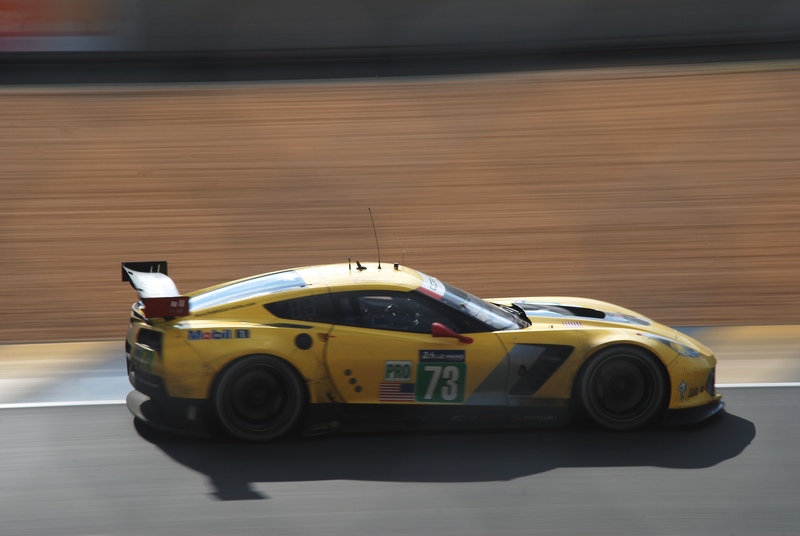 One hour later, I was now parked in section M-1, and began collecting my camera gear in anticipation of the fulfillment of a lifelong dream; experiencing and creating a photographic record of my around the clock adventure at the 2014 24 Hours of Le Mans. 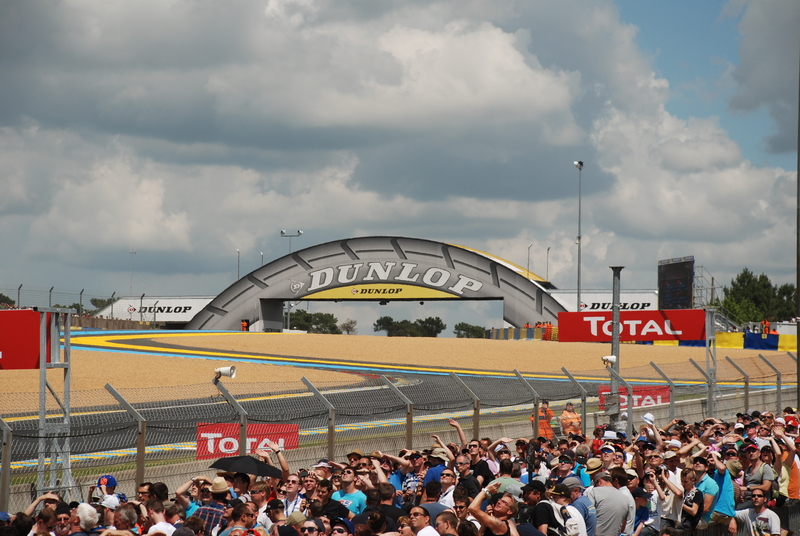 So with all of my gear stowed in my backpack, it was time for “Step One”; Finding the entrance into the race track. 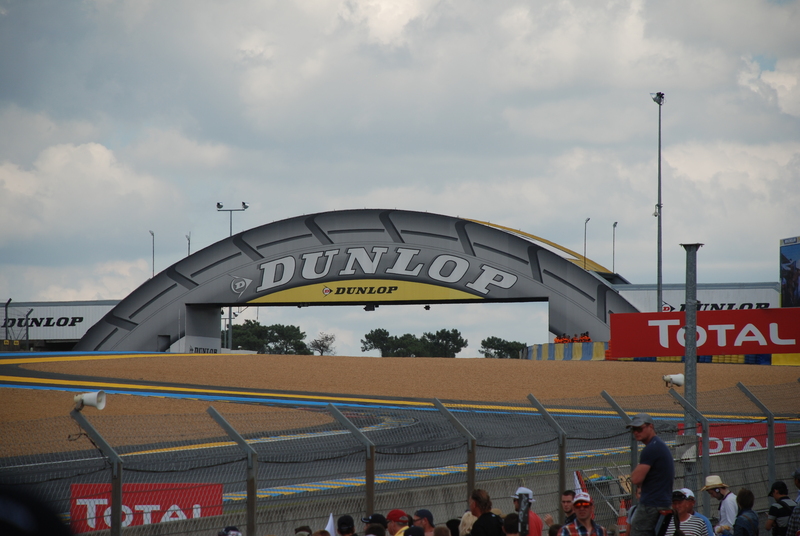 Fortunately, the entry structure was visible from the parking lot, and just a short hike from my car. 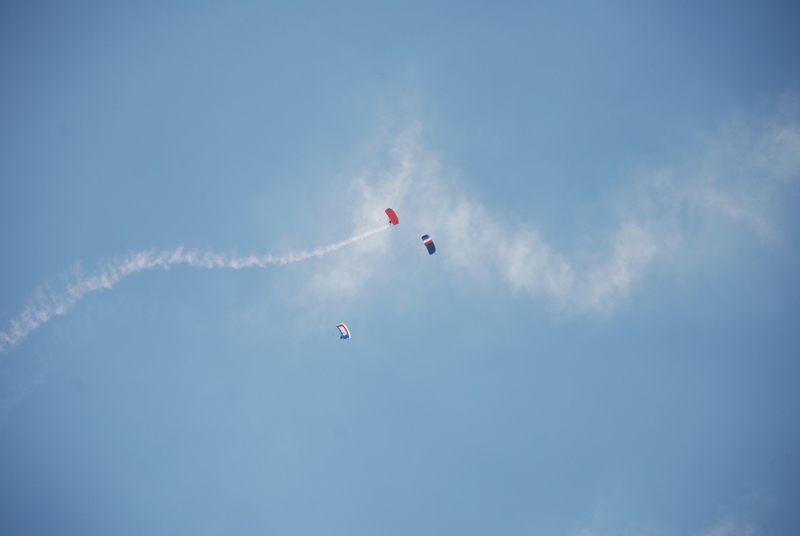 As I approached, It quickly became obvious as to its function; the entry side was to the left, and the exit was to the right. 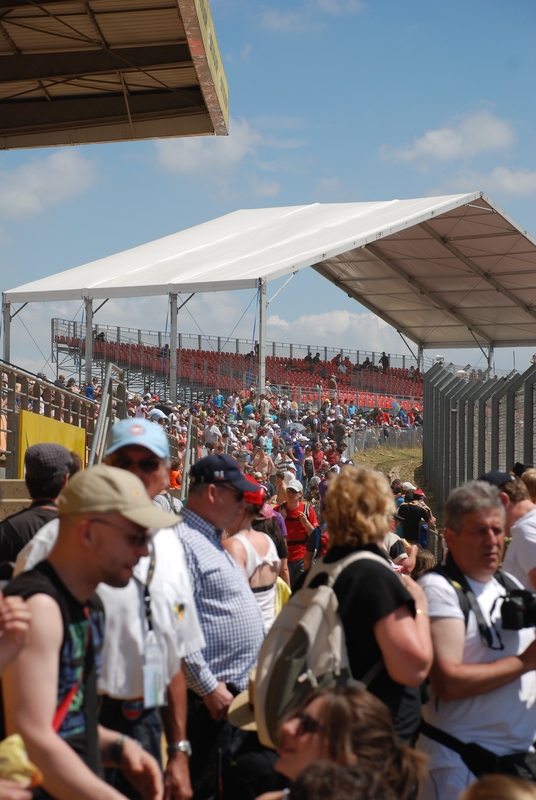 The entry procedure turned out to be very streamlined and efficient; multiple staff members were stationed at each portal with a hand-held scanner, giving them the ability to keep the flow of fans moving quickly. 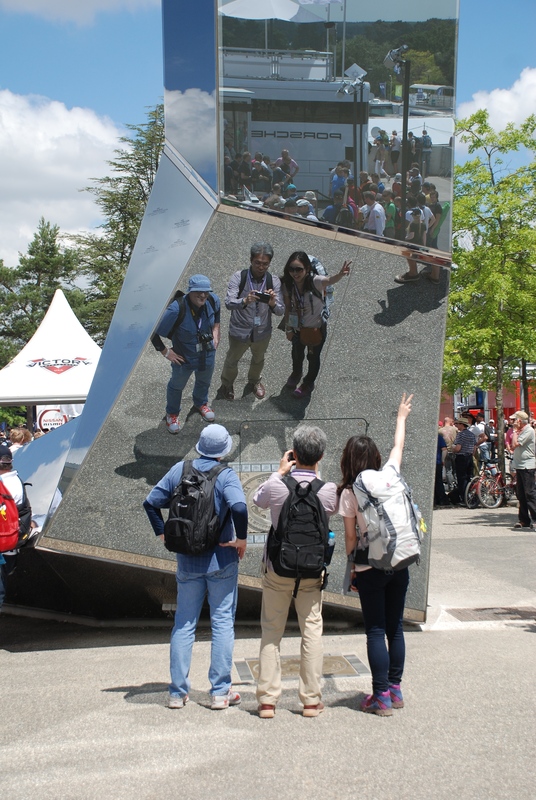 Throughout the 24 hours, whether entering, exiting or re-entering, your admission pass was scanned, to insure validity, and eliminated the need to rubber stamp people’s hands. 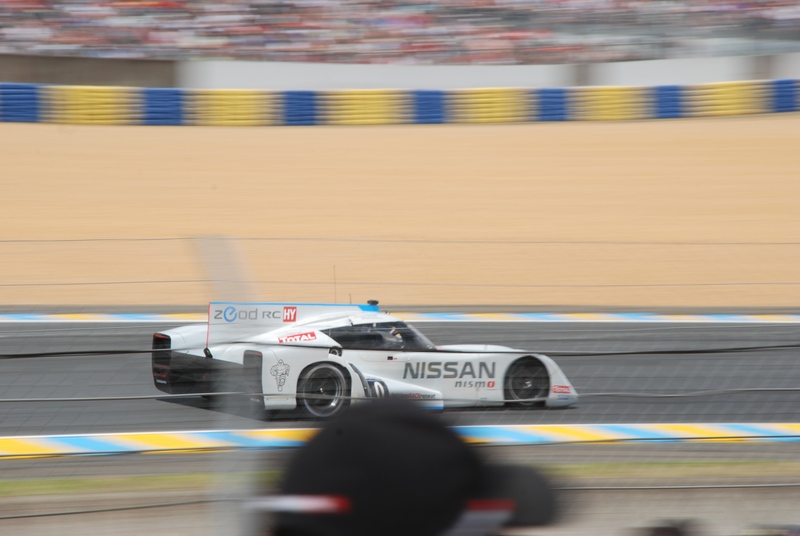 I personally tested this process out several times over the 24 hours, and can attest to its efficiency. 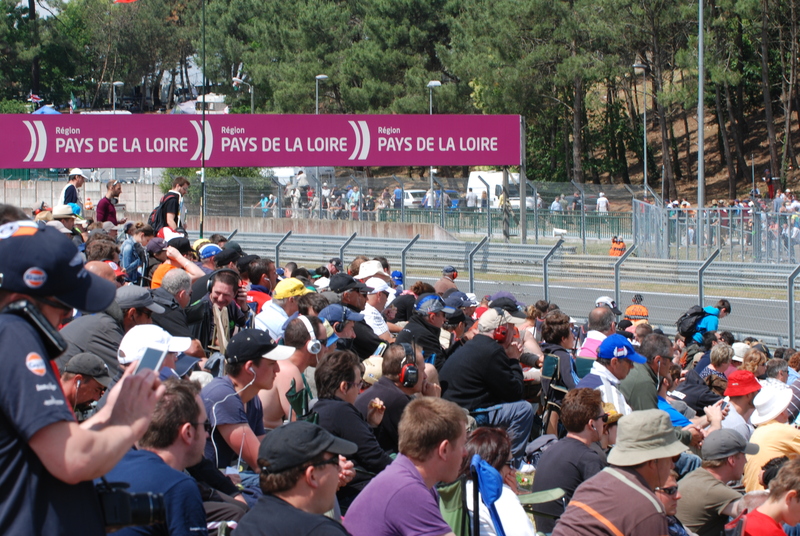 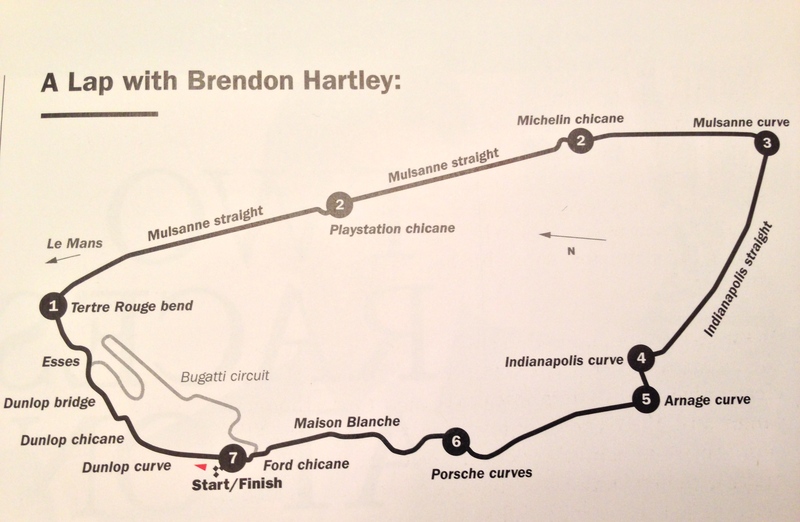 It also became apparent that the European race fans take their motor racing very seriously, as witnessed by the crowds already present, and the ever-increasing number of fans that continued to fill the track, as well as the grandstands adjacent to the bridge. 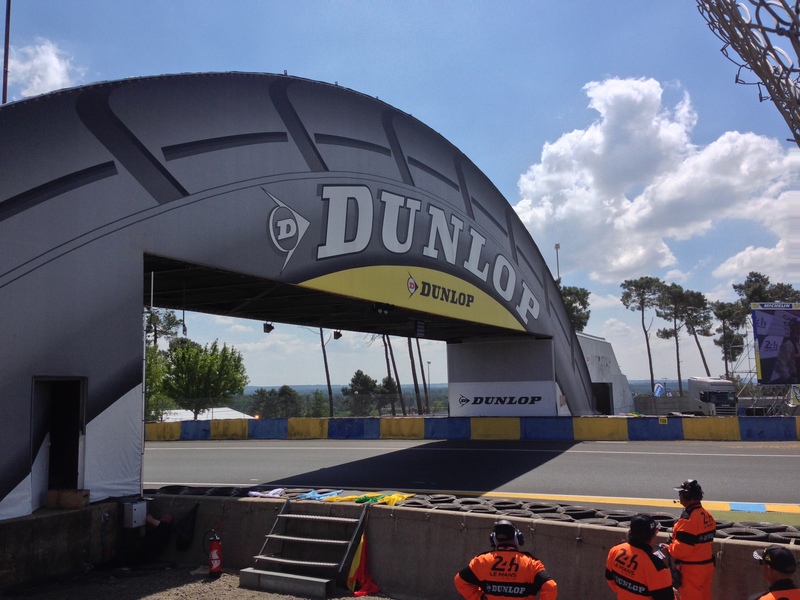 Having completed my hike around the outside areas of the track near the Dunlop bridge, it was time to return to the infield area and begin exploring the infield area known as the “Village”. 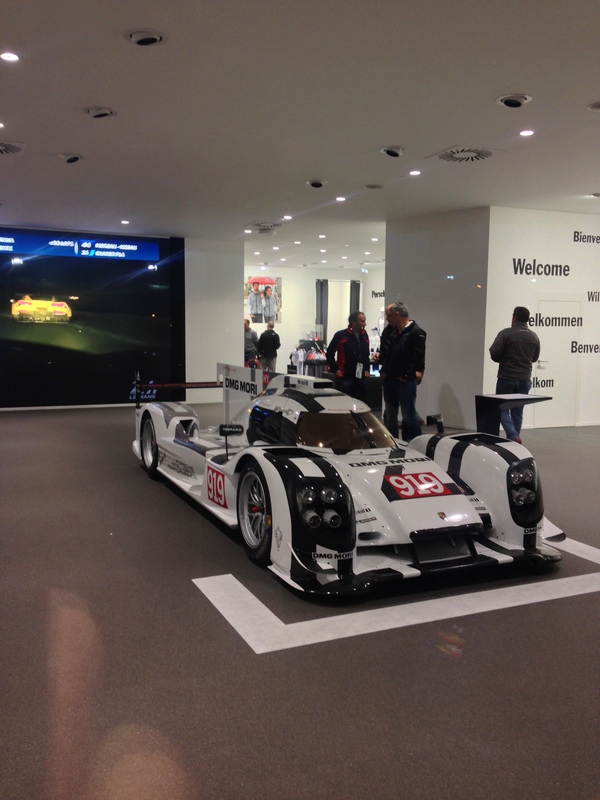 After leaving the Audi boutique, it was time to explore more of the venues present within the Village. 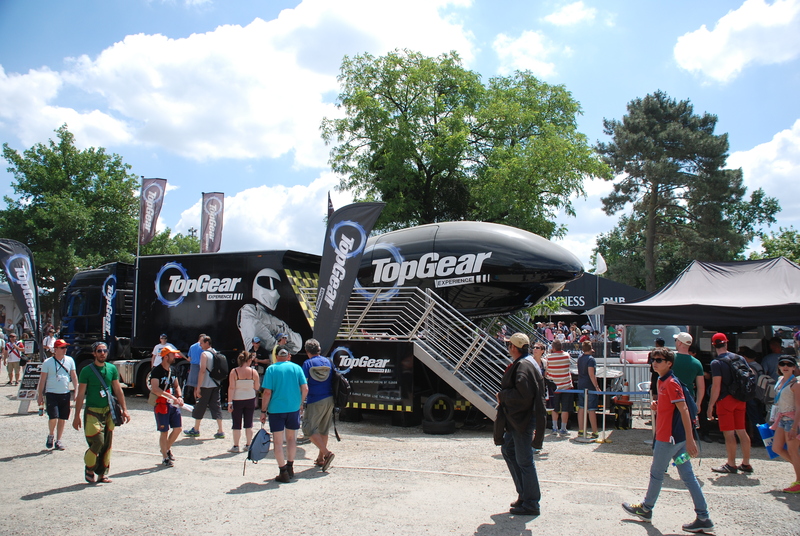 Walking along the pathway, I came across the Top Gear simulator, which every few minutes would swallow up a new batch of guests in their motion base simulator. 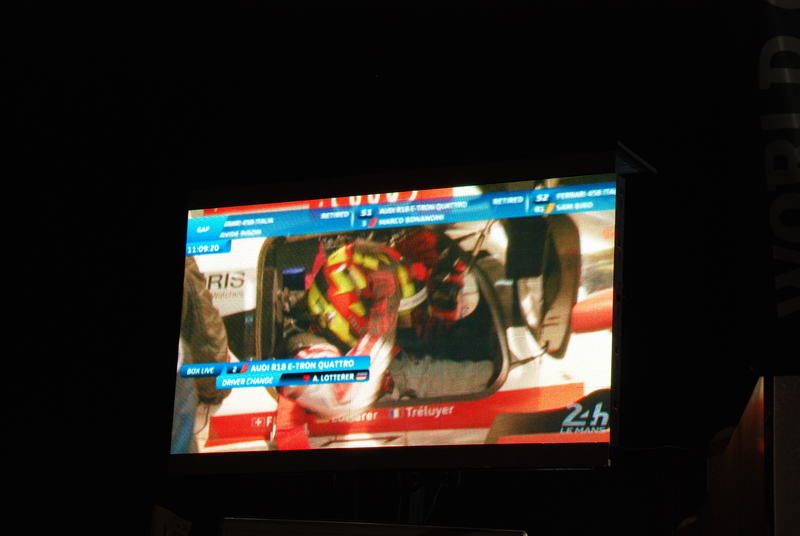 The audio volume within the simulator had been cranked up so high, that standing outside, you could still hear the internal audio track. 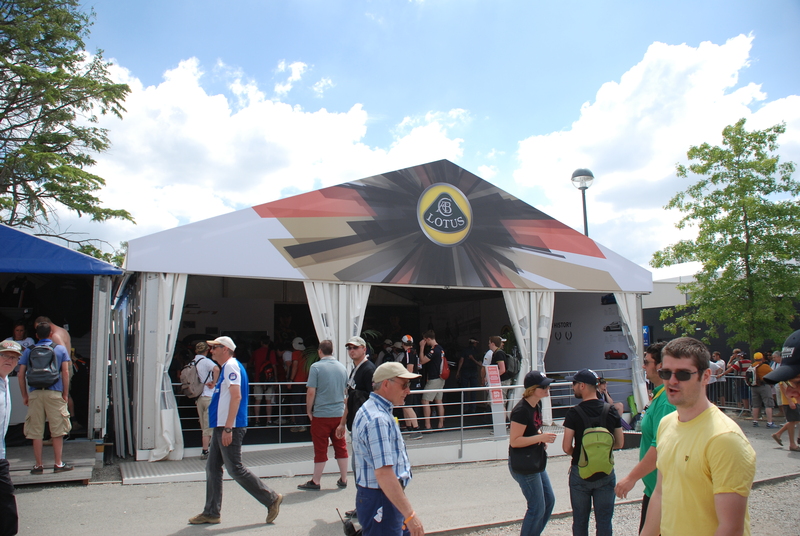 and right next door was Lotus. 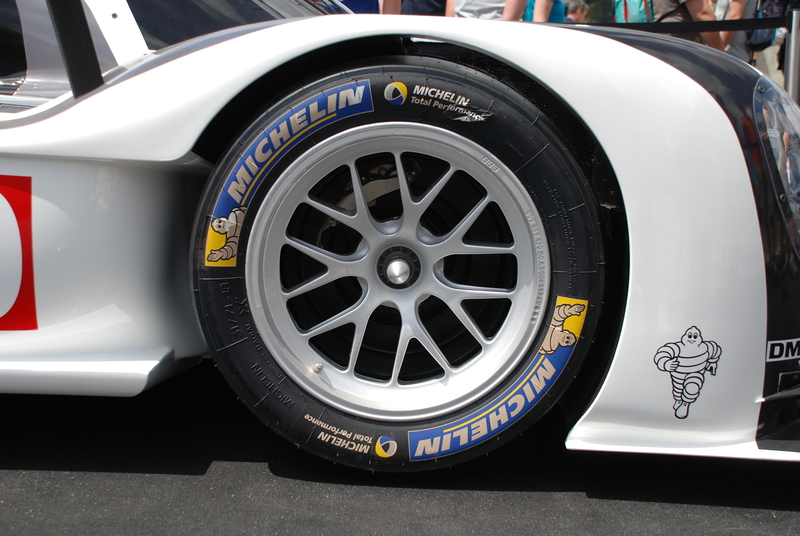 After escaping from the band, I made my way over to the Michelin display, which described the development of race tire technology (as used on Porsche’s new 919 Hybrid), and the transfer of these technologies and applications to their street tires.And to demonstrate their street car applications, they just happened to have on display one very silver, 2014 Porsches GT3 shod with Michelin tires. 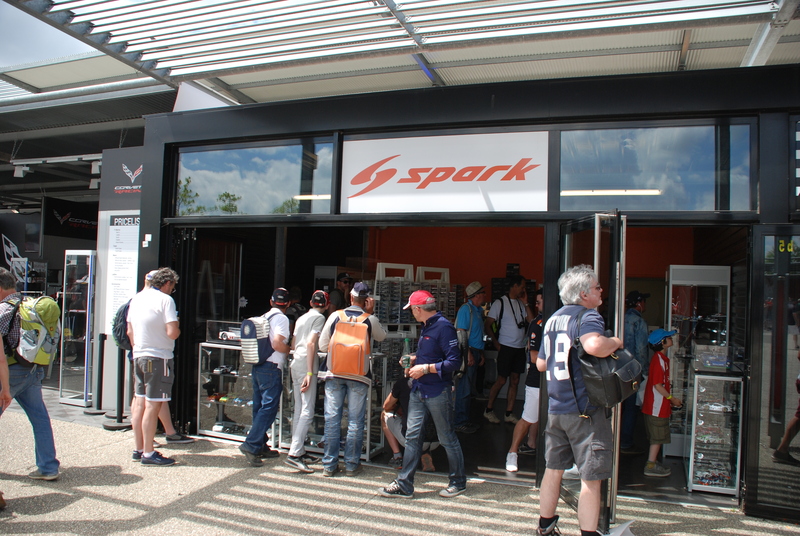 Located a short distance from the Michelin display was the Spark boutique, dedicated to the fans who like their cars on a smaller scale. 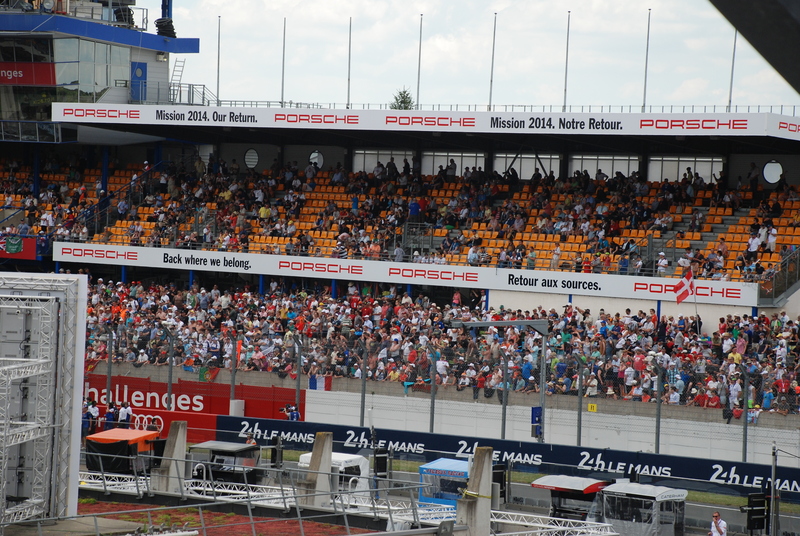 Another of the very crowded boutiques, but with a predominately male shopper. 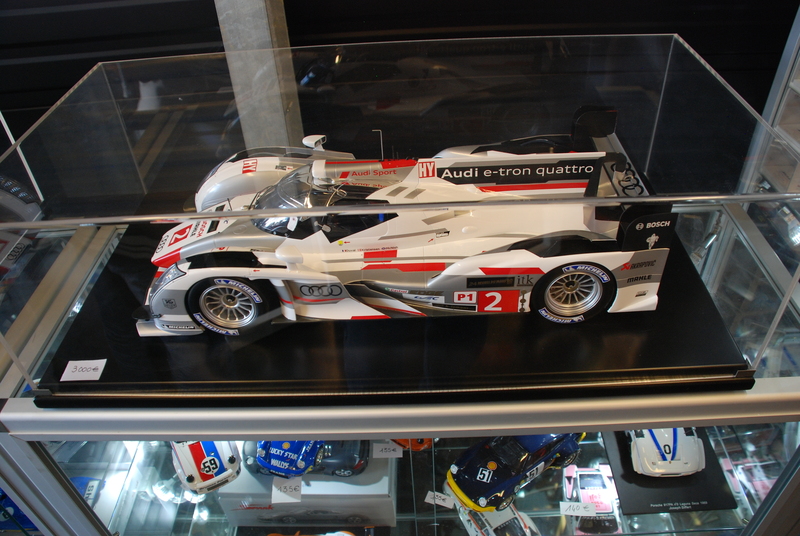 As the photo below illustrates, Spark produces some of the nicest scale, display models of any company. 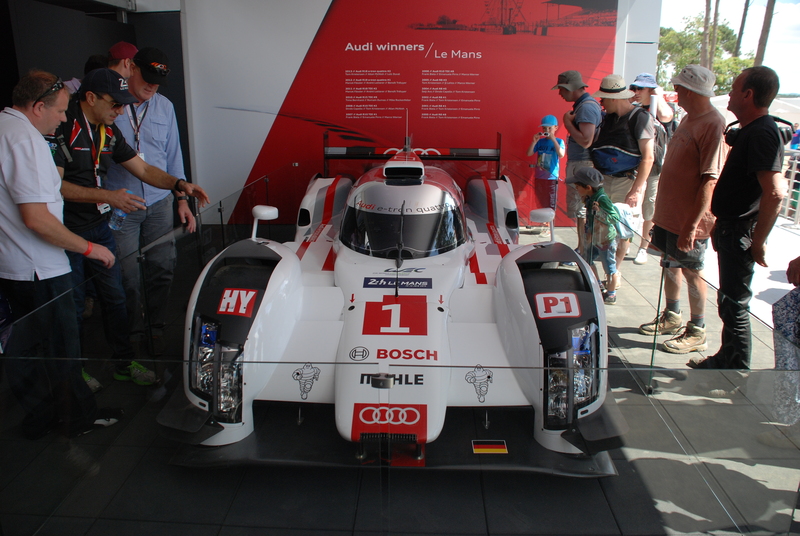 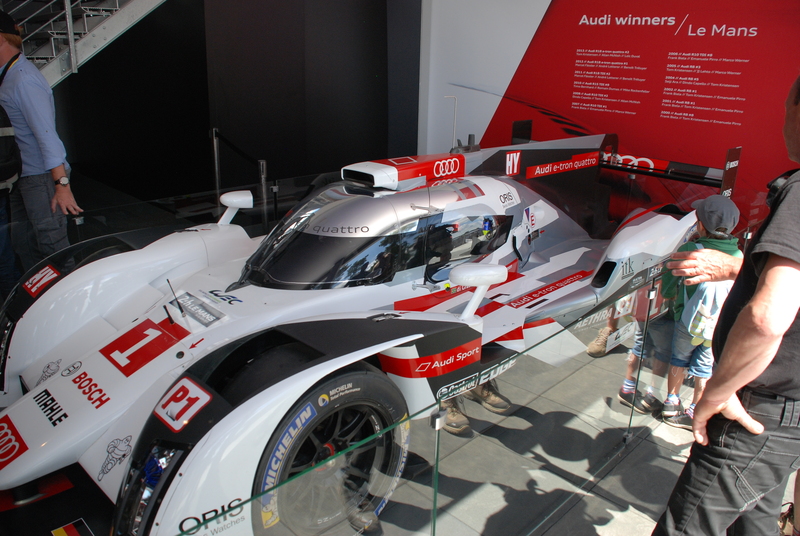 The large-scale, Audi R-18 e-tron on display was amazing, as was the asking price; 3000 euro, which in dollars worked out to roughly $4080.00 !! 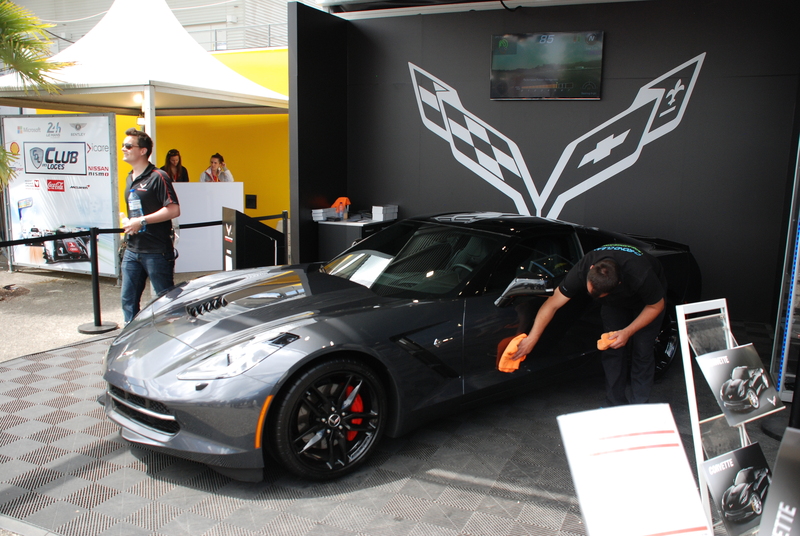 Located right next to the Spark boutique, was GM’s display and boutique, which displayed a single, 2014 charcoal gray Chevrolet Corvette C7. 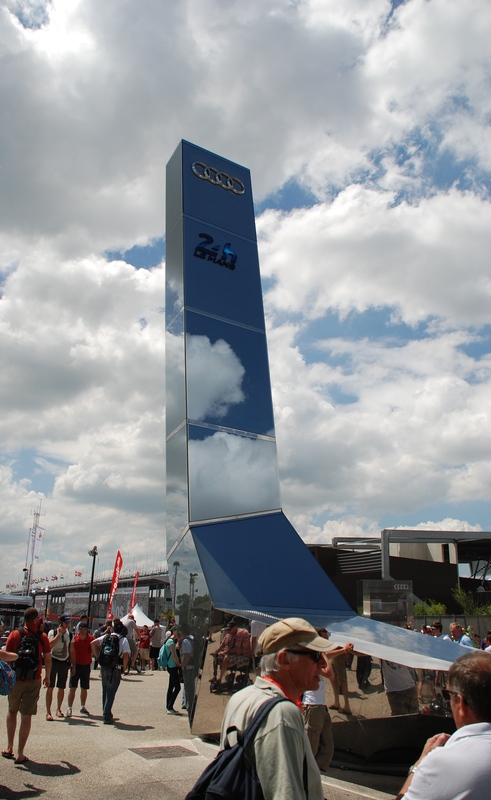 Another of the impressive sights found within the Village, and close to the Paddock; the massive, polished metal Audi monolith, positioned in the middle of the plaza. 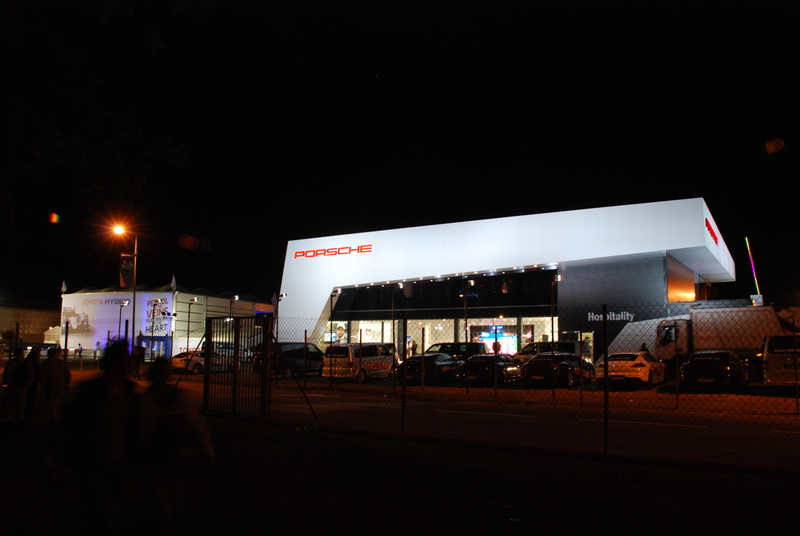 Located directly opposite of this monolith, was the automotive boutique that I had hoped to find. 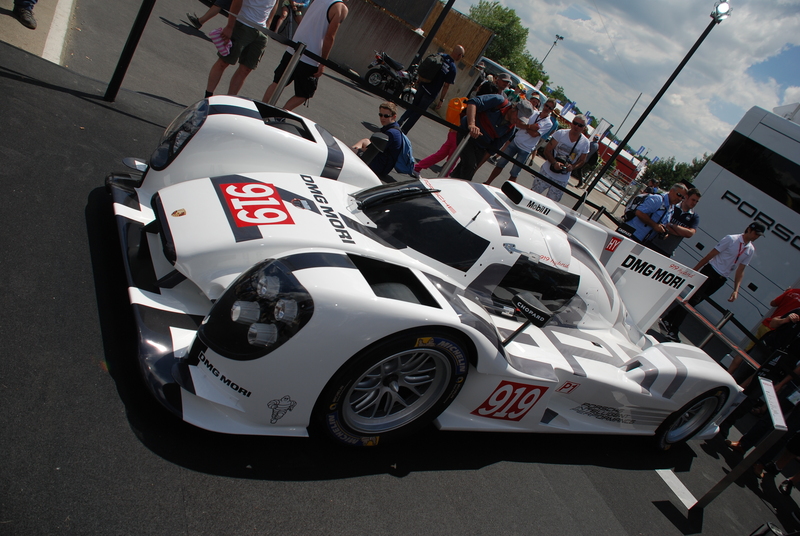 Positioned out front were two examples of Porsches latest race cars; a GT3 Cup Car, and an example of their brand new LMP1 class, 919 Hybrid. 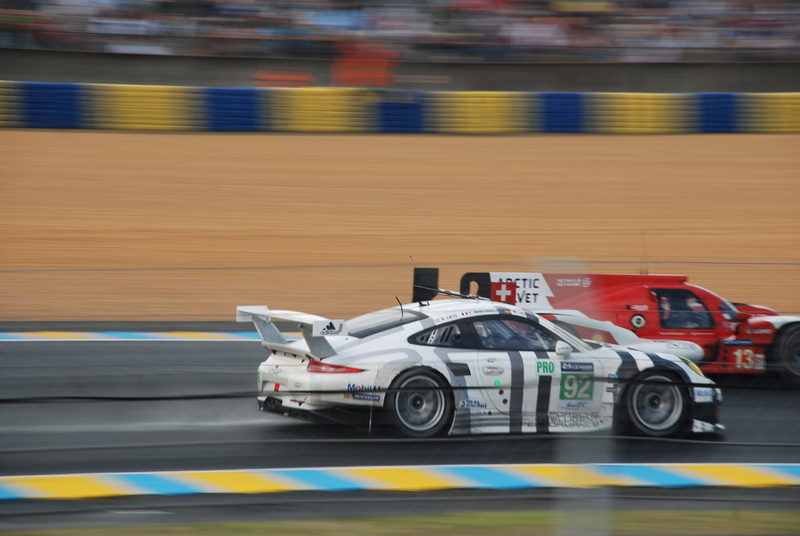 Serving as the backdrop for these two race cars, was a semi tractor-trailer designed as a rolling Porsche boutique, complete with pop-outs to deliver an expandable showroom. 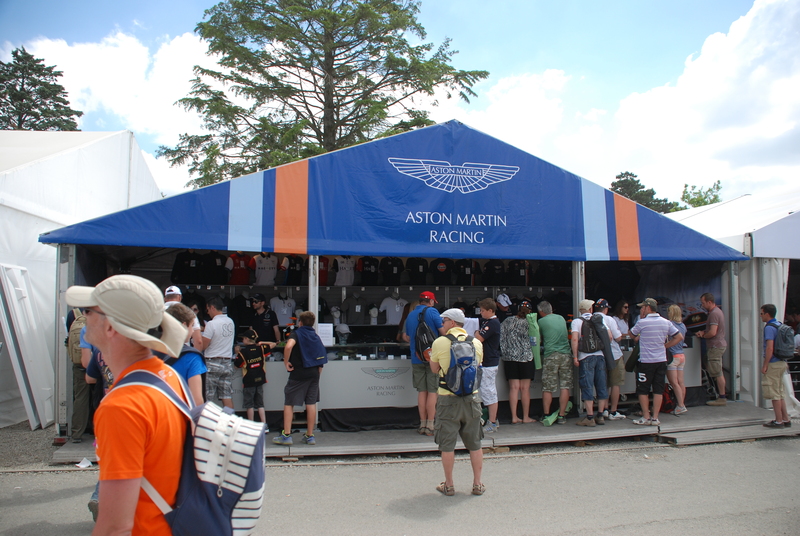 As much as I wanted to enter the boutique to check out the contents, the line to enter continued to grow in size and the number of people entering was being regulated, so I figured I would return later. 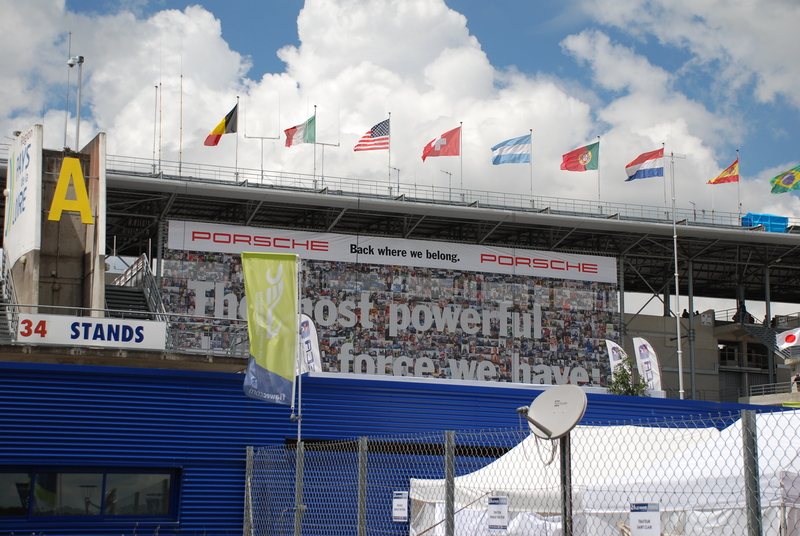 Below, the multi-storied Race Control building, whose occupants would be responsible for managing the race for the full 24 hours, and located at the entrance to pit lane. 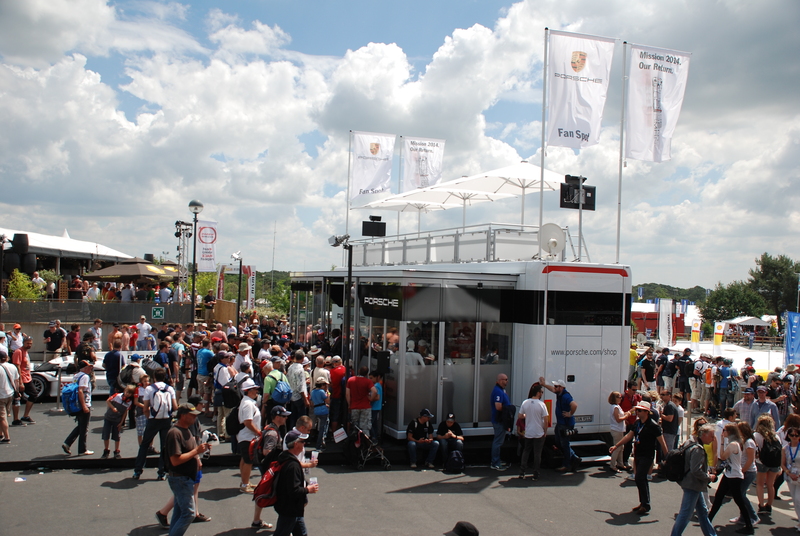 Circling the garage / paddock area, I was fortunate to spot the latest race car transporters for the Porsche factory team; commissioned with delivering their new LMP1 919 hybrids to race tracks throughout Europe. 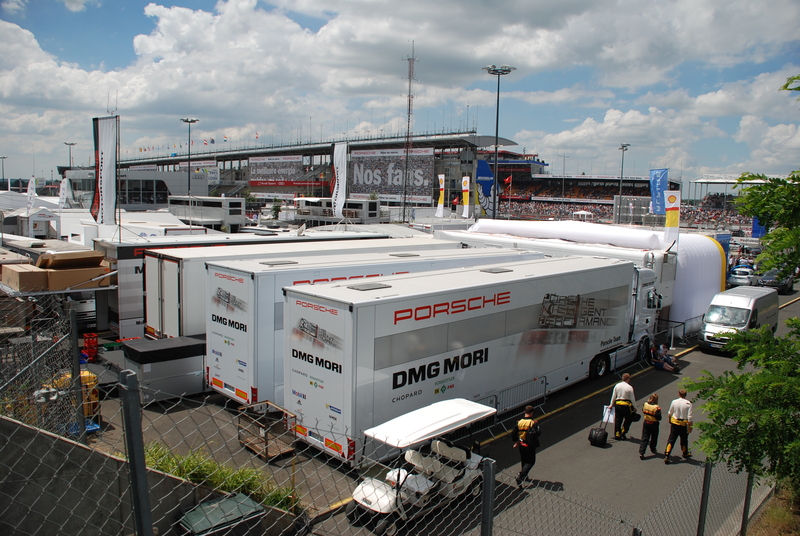 Spotted parked four rigs over from the end, was this tractor/trailer combo for Porsche Motorsports. 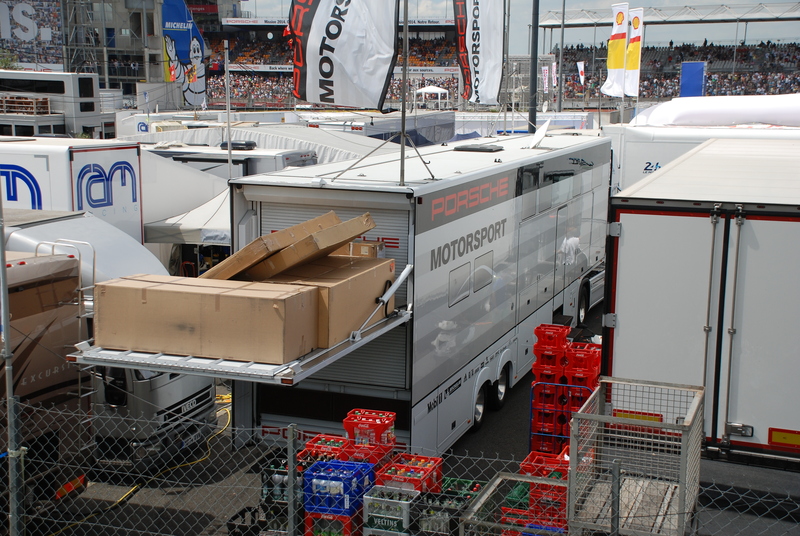 I suspect that the large boxes on the rear lift gate contained body parts for either the latest 911 RSR’s or the new 919 hybrid. 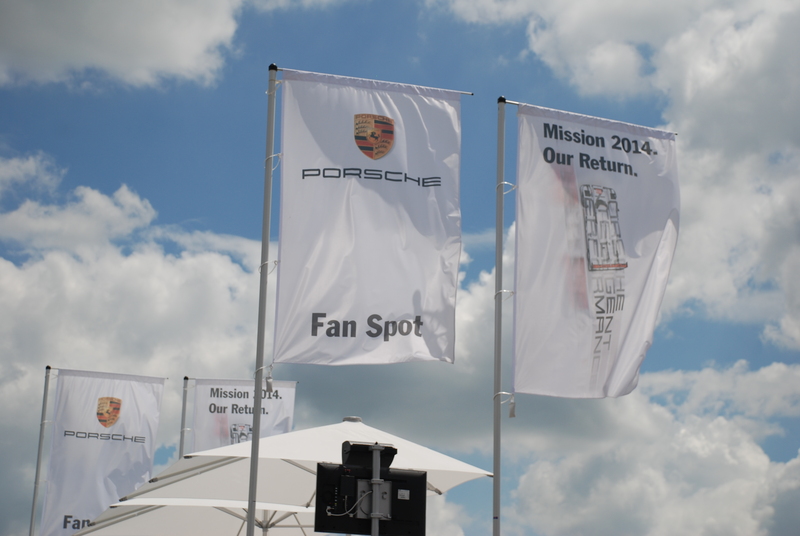 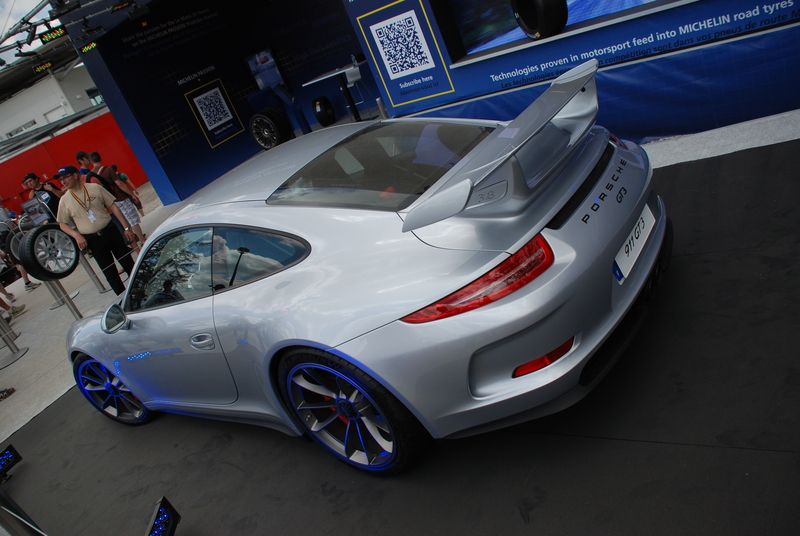 Being the ever inquisitive Porsche fan, I walked up to the tent flap to see what was inside. 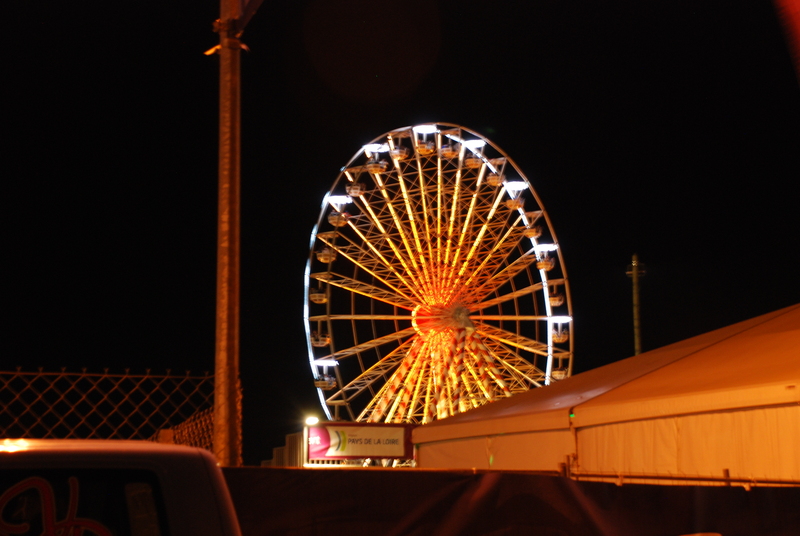 Looking inside, I found a crew still in the process of working to complete the display. 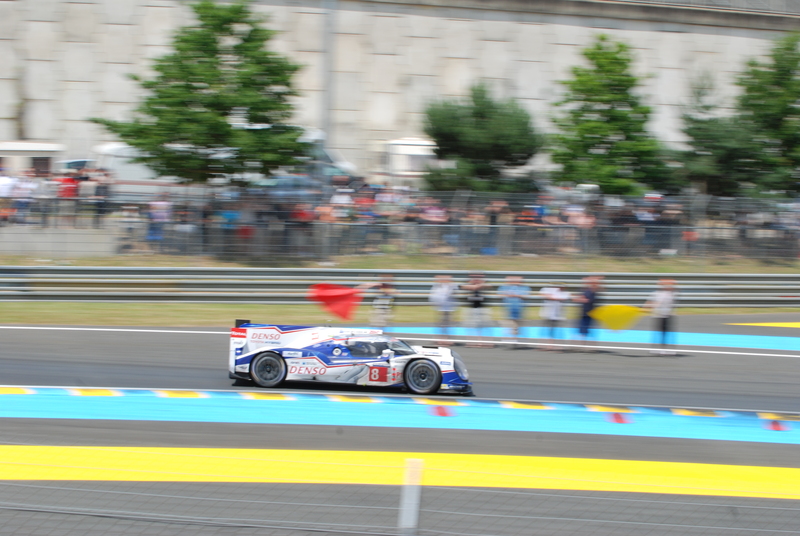 I was able to grab a few quick shots as they made their way toward where I was standing. 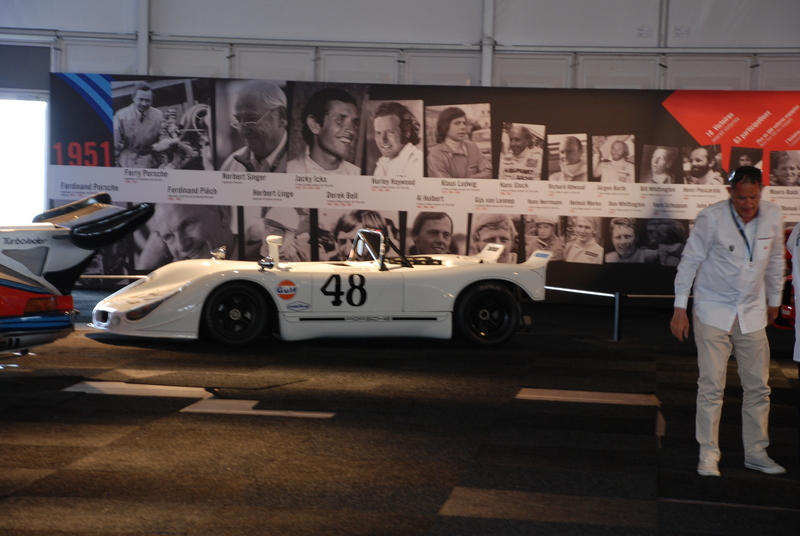 My first shot (above), was of what appeared to be the Porsche 908/02 that Steve McQueen and Peter Revson drove to a second place finish at Sebring back in 1970. 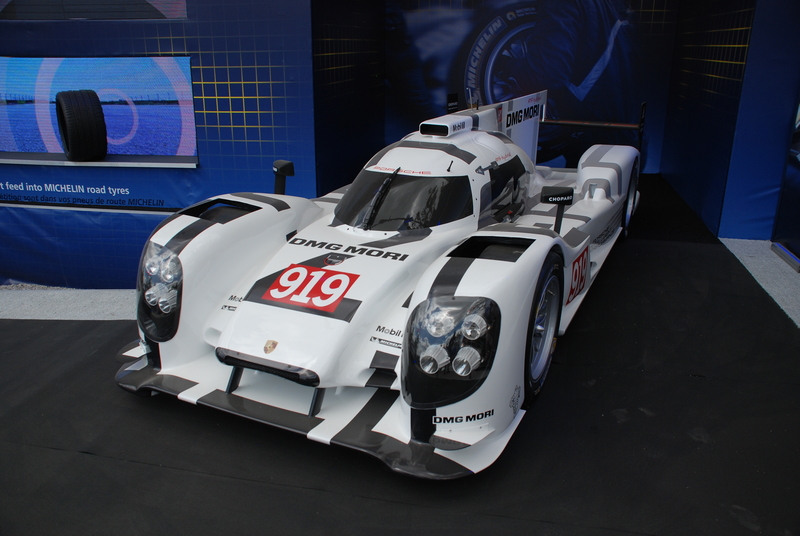 Would having this car on site bring luck to the multiple Porsche teams competing at this years race, and would Porsche repeat their overall race victory this year with their new 919 hybrid? 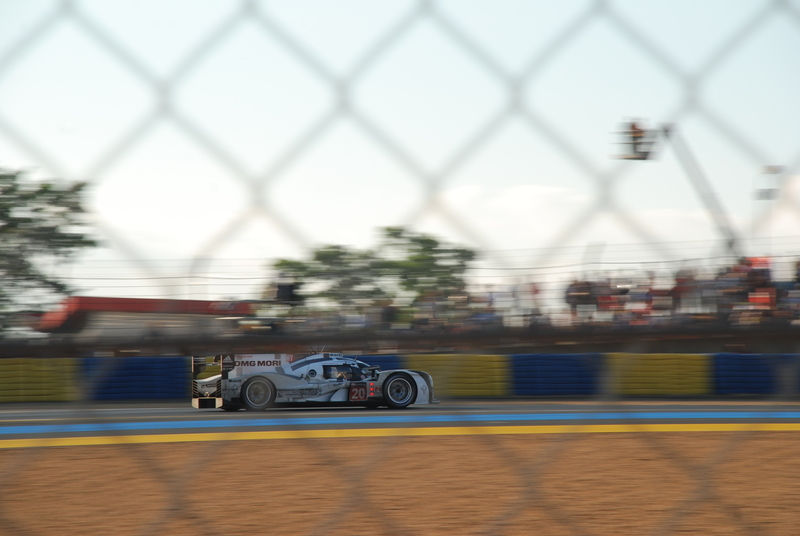 Please stay tuned for part two of my blog, which will cover the entire 24 hours of the race, as well as my post race travels through the Loire Valley and return to Paris.